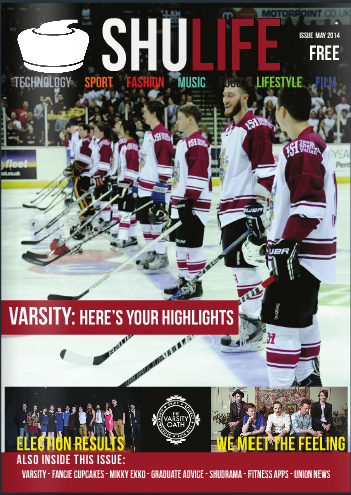 The brief for this project was to create a name, masthead, covers and features for a new Sheffield magazine aimed at Sheffield College students. RESEARCH: I started researching regional and national magazines, to see how they are laid out, the consistency in them and how they appealed to their target audience. Exposed is a regional magazine for Sheffield. It’s main focus is entertainment. IMAGE: The image is of Arnold Schwarzenegger, who isn’t related to Sheffield, which makes you think why he is one the cover. This gets your attention. 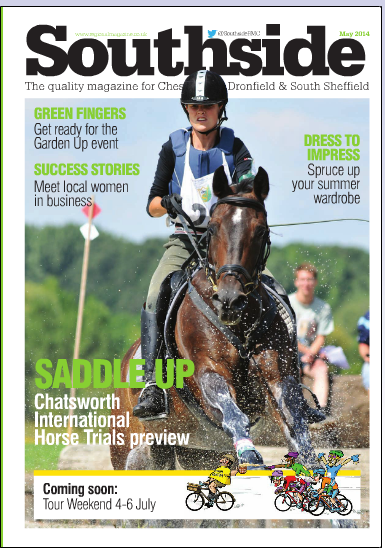 However, he is very famous, which also begs the question, why is he on a Sheffield magazine? The plain background doesn’t distract from the main image, but the worn texture and the fact he holds a gun expresses the type of movies he usually in. MASTHEAD: The masthead is in all caps and is very bold, which relates to the title. The square brackets ‘outline’ the masthead, section it off from the page and helps it stand out. Square brackets are used in grammar to add clarity to the situation(http://www.oxforddictionaries.com/words/brackets), which adds relevance, making it clear that this is Exposed magazine. Arnie is in front of the text, this usually shows that the magazine is well known and the name and typeface are recognizable (a smaller or newer magazine wouldn’t usually do this). COVER LINES: The main cover line is large and in your face, so the question that is posed by having Schwarzenegger on the cover(that i mentioned previously) is now answered. It is placed centrally and covers most of the image. This is probably because the person is so well known, you don’t need to see the full picture to know who he is (similarly to the Total Film magazine I researched further down (and unlike the Southside magazine below)). As that is the main feature, the text is larger, the less important articles (but still important to be shown on the cover) are in smaller writing, adding hierarchy to the text. Like most magazines, the feature pages start with usually a double page spread with a title, image and a small amount of introductory text. This main feature page conforms to that. The photo overlapping the text and border made it stand out more and the big, bold title aided that. In my opinion, the text is a bit squashed, but there is still clear hierarchy. Your eye is drawn to the image because it overlaps, then to the title, then you read the text. Having a plain grey background makes it better because there is less to focus on so it is easier on the eye. There was only one other page to this feature which seemed a bit weird. Like most magazines, each page doesn’t stay with the exact same layout each time. 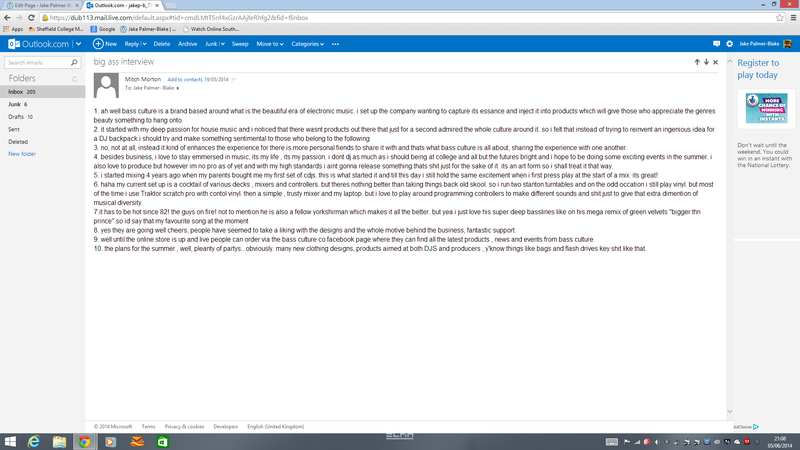 However, they do have consistent aspects so it doesn’t seem totally random (be it borders, headers, footers etc.). 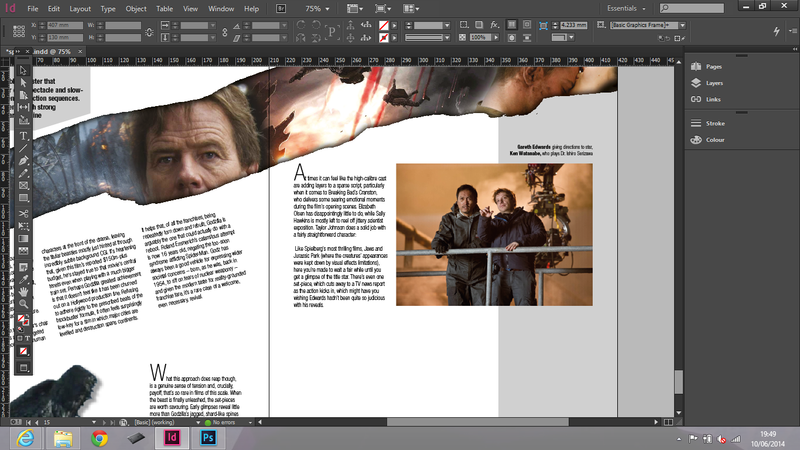 Like in this magazine, the majority of pages have a thin line border with a thicker line at the top. In a music section of Exposed, it has small image in the top left this is so you can tell it is part of the same section. That same image is used on the cover, letting you know what page number it starts on, so it is easy to find that section, you just flick through it and look for the image. What I found annoying in this section was that one page was an article and the opposite was an advert (still music related, but not always relating to the previous article). I suppose this help separate the articles though. This magazine was one of a number published by the RMC (Regional Magazine Company). There are four different magazines in this series for the different sections of Yorkshire (Northside, Southside, Eastside & Westside). They covers all have the same layout style, masthead in the same font and colour, the name just varies. This keeps it consistent so you know it is from the same group of magazines. IMAGE: The image relates to the main feature in this issue. Like the Exposed magazine, the image is in front of the masthead. I think the reason for this is different to the usual reason for this. As it is not that well known to the general public, I think it is because the image itself is an ‘active’ image with lots of movement involved in it, so by having it ‘jumping’ off the page, it grabs your attention than if it was just a flat looking image with no overlapping. MASTHEAD: The title is a longer word so it has had to be smaller to fit the width of the page. There is also a lot o content around the Masthead (the date, price, issue number etc.) so that again makes it look less significant on the page. What does make it stand out is that it is on a plain white background, rather than a texture or the actual image. This puts a border around the main image which helps it to separate it from the rest of the content on the page. COVER LINES: There is clear hierarchy within the text. The white text and larger font for the main cover line helps it stand out as the main feature. Having said that, I don’t think it is done as well as other magazines. The banner at the bottom gives more insight to what is in the magazine. I’m only mentioning this because for some reason, I thought is was an ad or something for the Co-op. They have used the same typeface and weights and a similar colour as the Co-op do. I’m not saying they shouldn’t have done it, just an observation. The main feature page didn’t really differ from the rest of the magazine as it should do. The lack of ‘intro page’ meant that it wasn’t as easy to find. So if you were scanning through trying to find it, you could easily miss it. There wasn’t very much hierarchy which again made it harder to differentiate it from any other article. Like most magazines, it worked to a 3 column grid. The rest of the booklet didn’t seem very well thought out, in my opinion. I could understand the need for lots of adverts because it is a free magazine so that is how they make their money. But it was hard to make out what was advert and what was article in some places. There was like a little tag in the top right which indicated that it was an article. Also there were the titles, but they didn’t stand out very much and there wasn’t much hierarchy to make it interesting. 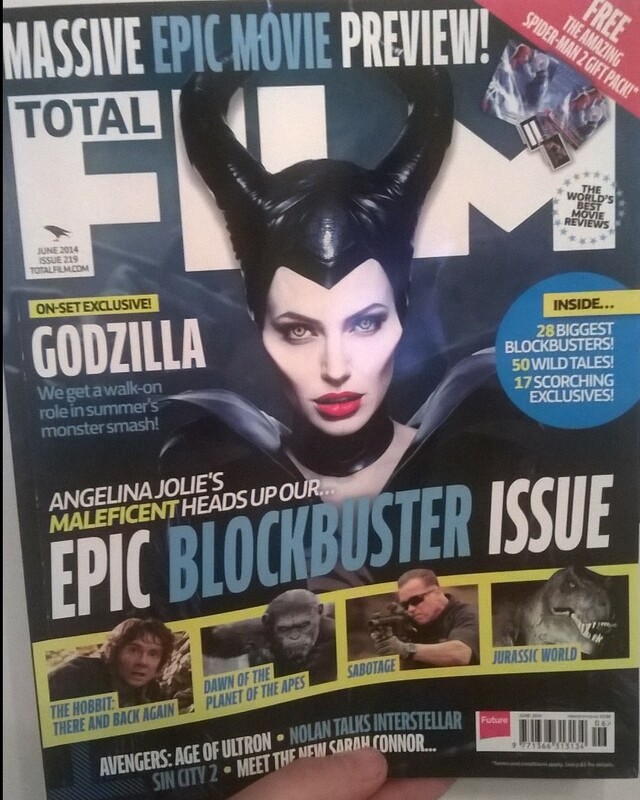 Total Film is, you guessed it, a magazine containing film reviews, previews and more. I chose to look at this type of magazine as it focuses on one thing, films. Rather than the other magazines I have looked at which tend to contain more than just one subject. IMAGE: The photo of Angelina Jolie grabs your attention by the way it seems she stares into your soul. This help draw you in as I think this cover is so cluttered (but not in a bad way, it’s still clearly laid out). Again, she is in front of the masthead because this is a very well known magazine. Unlike the Exposed magazine, there looks to be more detail with the drop shadow of Angelina on the masthead, this makes it look more realistic which helps keep it consistent with the genre of the magazine. As film effects are getting more realistic, why shouldn’t this? MASTHEAD: The title is quite long, being that is includes 2 words, but I like what they have done by placing the TOTAL inside of the F. This saves space and allows FILM to to take up a good amount of space. Because it is only four letters it can be larger on the page, also it is in a very bold typeface which helps it stand out, which it need to because of the mass of content on the cover. COVER LINES: Unlike the other magazines, this one doesn’t seem to have the main cover line relating that much to the image. As you can see, the text relating to the photo (and what should be the main feature) is on top of the “epic blockbuster issue”. The same 3 colours are used in the text and the only thing giving it hierarchy are the sizes. I also don’t like the text above the masthead, that looks out of place. I suppose this style mirrors a film or film poster, in the way that they want it to pop out at you but I think there is too much on this cover. I stared analyzing with the feature pages. 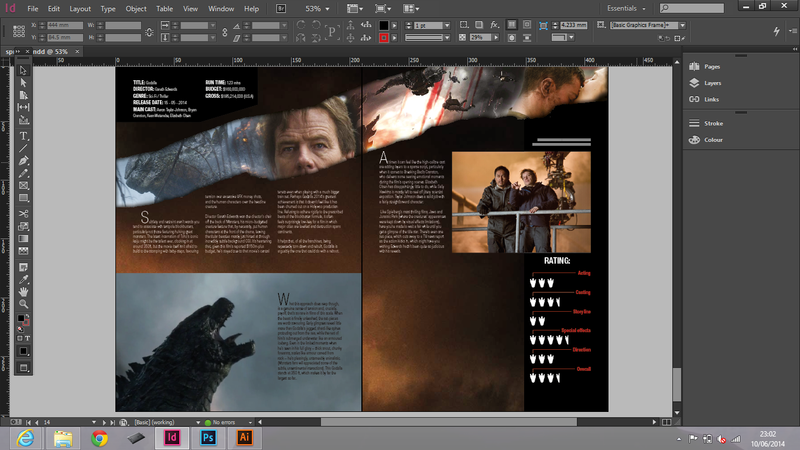 (This one being the new film Maleficent), like most, the first is a double page spread including one background image with a title and introductory text, this helps to section it off from the rest of the magazine and introduces the feature. Usually they are around the centre of the magazine. I liked what they did with the title by including the bird, not much as been edited but it’s just a nice touch to keep it from being plain. I noticed there is also a bird silhouette on the cover, this helps the cover and the feature page link together. 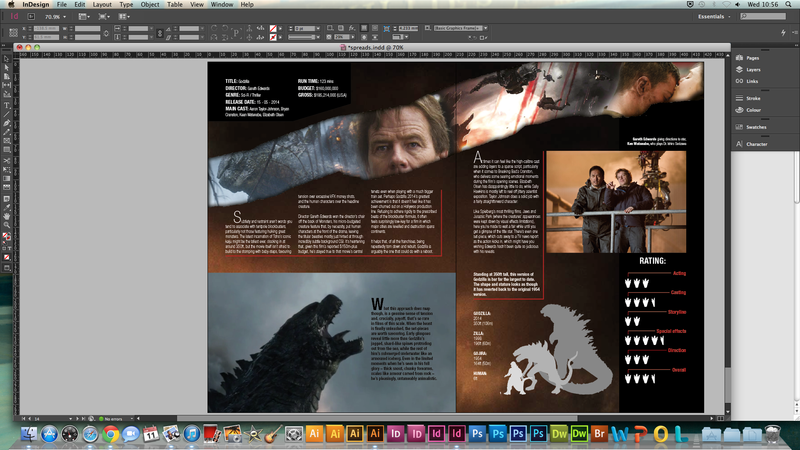 The following pages have the same layout with small adjustments. 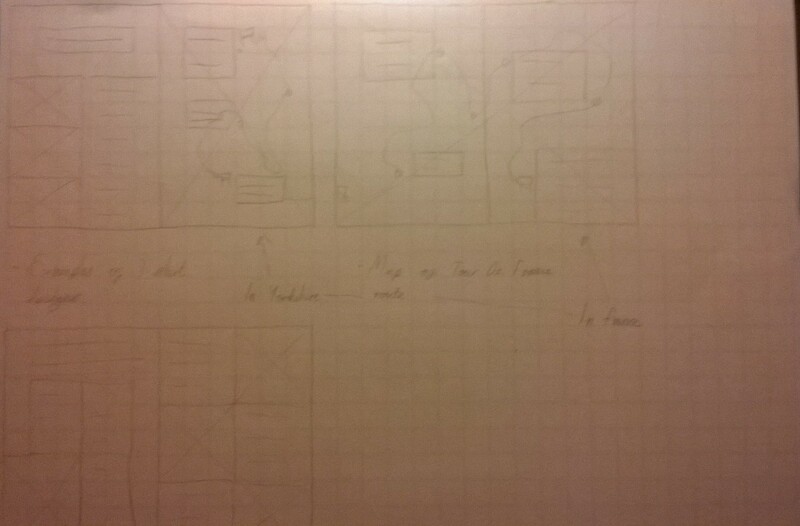 Each page works to a 3 column grid which helps break down the text. The large image is in the same place with a smaller one overlapping on the right, this keeps consistency you you know you are still reading the same article. There is consistency throughout this magazine. 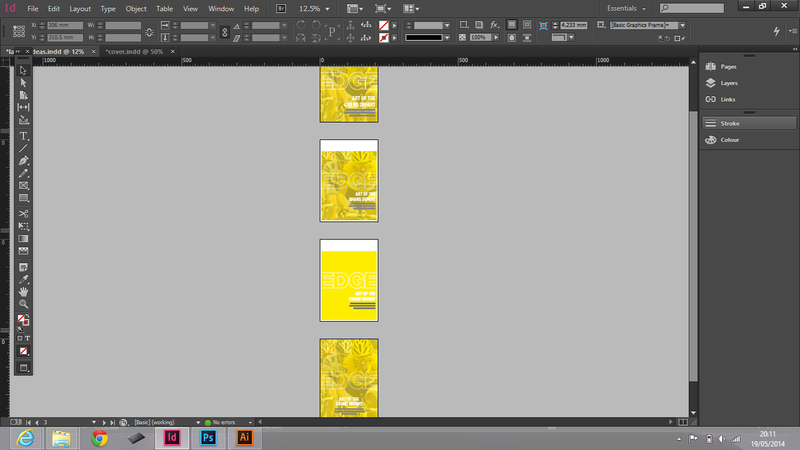 I don’t mean that every page has the exact same layout, the content does vary which make it less dull and samey. In this magazine, they have different sections which they have in every issue. It includes the same header on each page belonging to that section. The LOUNGE section i liked (design wise) because it incorporated a line pattern as a border and also in the titles. It helped it to differentiate itself from other features in the magazine. Kerrang is a rock/metal magazine. Like Total Film, I chose to annotate this one as it focuses on one area rather than numerous and I wanted to see how it conforms to appeal to the target audience. IMAGE: The image itself of Kurt Cobain is simple with him just on a plain black background. His head overlaps the title because the magazine and the typeface is well known. 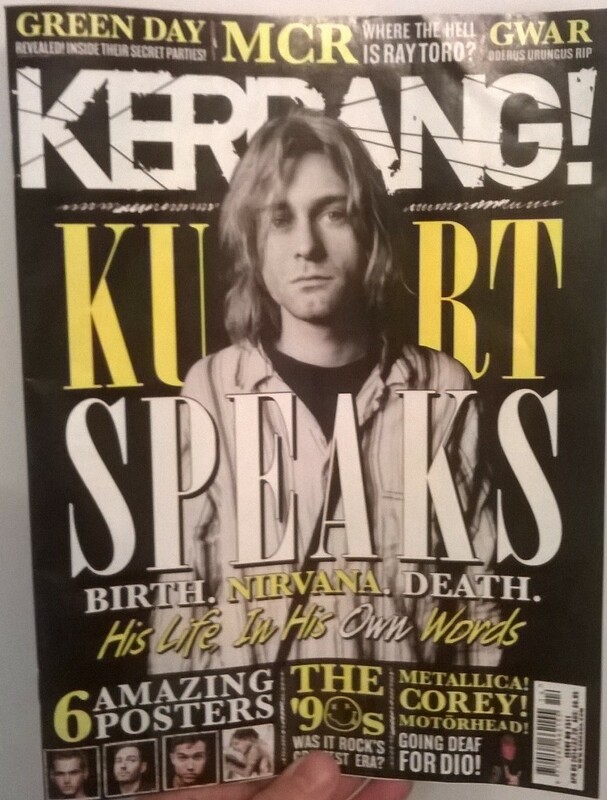 MASTHEAD: The text Kerrang use for their typeface looks worn and shattered, this related to the type of music promoted in this magazine and also the stereotypical style of the music and target audience. From this, I have seen that the mastheads don’t just have to be unedited text, but then again, I wouldn’t want to go too far. Kerrang have a good balance of modification to the letters. There isn’t that much that it looks bad or looks like a logo, but there is just enough to add a relevant styling to it which makes it different to most other mastheads. COVER LINES: The main cover line works around the main image, which gives something to it rather than being just a simple image that I said before. The typeface used relates to the image and main feature as it is the same as Nirvana used (Onyx). Other than the banners at the bottom and top of the page, the text is pretty much just for the main feature about Kurt Cobain. Hierarchy is achieved by the use of different typefaces. It is a simple, structured layout (as opposed to the Total Film cover) which is good, but I would have thought it to be a bit more chaotic (similarly to the Total film magazine) to further relate to the style of the Masthead and the content of the magazine. The Kerrang magazine did the main feature section well I think. It stood out to the rest of the mag because the background was black, whereas the rest was white (other than the odd page and advert page). Again the style in the main feature was consistent with the banners running down each side. They used the Nirvana typeface and logo on the main page so you know you were reading the main feature. 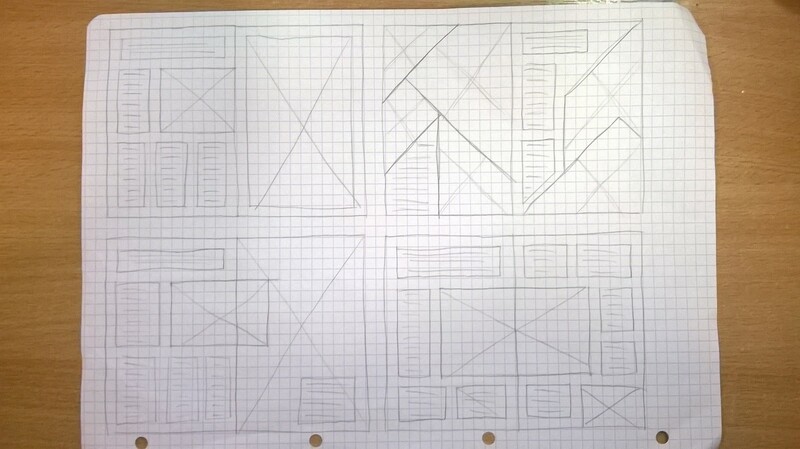 The first spread was a 2 column grid which was more suitable because there was less content to cram in. The rest was a 3 column grid, with overlapping images which helped break it up and kept it from being strenuous when trying to read it. The magazine has these circles in the top left when you get to a different section in the mag. These use the same typeface and scribbled looking circles as section dividers. Again, the individual pages aren’t very similar, but in a good way, so the little touches (such as a border or typeface) stay consistent but the way they are used vary throughout, to keep it from being boring. I thought I would research a student magazine, as the magazine we will be making would be for a fairly similar group of people. IMAGE: The image relates to the main cover line and the main feature inside. Unlike the other magazines I have looked at, the masthead is in front of the image, this is because it is a smaller, less known magazine as the others. There is nothing wrong with the image itself, but I would have used one with less going on in it, at least like on the Southside cover, there was more to the image, but there was still a focus on the horse and rider, instead of having a mid distance shot, which this one is. Unlike the other magazines, it doesn’t really grab your attention. MASTHEAD: I like what they have gone for on the masthead by separating the two words using colour instead of using a space, kind of like the GQ masthead. However, I don’t really think the colour stands out as much as it could. By not using a space, they have allowed the text to be larger than if it did use a space (like the Total Film where they put the TOTAL in the F). A vector image of ‘The Hubs’ helps it to relate more to Hallam. By doing this though, they have had to shrink the mast head, which isn’t that big of a deal, but they put the date and FREE on the right side so the masthead has been made smaller again. COVER LINES: Other than the banner at the bottom, there is only one cover line. Personally, I would have tried to do more with the cover line seeing as there is only one, at the moment it looks more like a secondary cover line would be. Similarly o the Southside magazine, I went through Shu life expecting to find a clear page to tell me this is the main feature. The first spread for the main article hardly had any imagery, and those used were quite small. I only realized it was related the the cover line because of the title, which did actually stand out. Also there was only one paragraph and one image that related to the image on the front. The magazine was fairly consistent throughout, in terms of styling. It has borders down each side, which were different colours depending on the section of the magazine. I liked how they used the same colours as they did on the cover with the text under the masthead. However, when I was flicking through it, the numbers kept moving instead of staying in the same place as they should, it was just little things like that which I thought wasn’t very good. On most of the pages there was clear hierarchy to the text, but they didn’t seem to do much with the imagery. 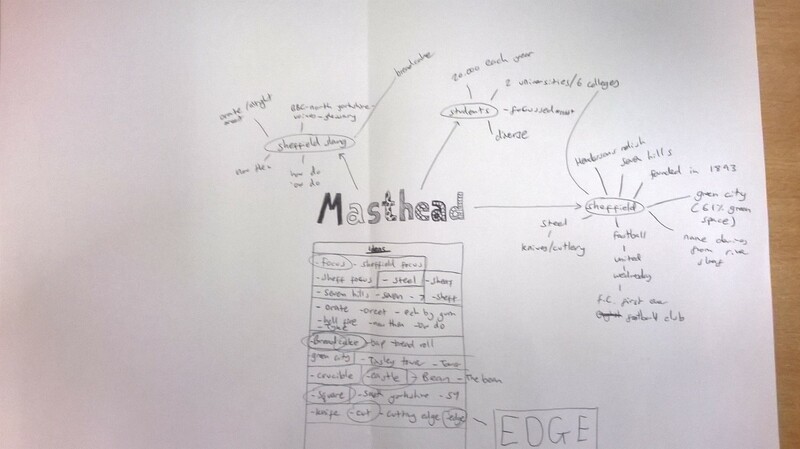 I did a mind map to generate name ideas for the magazine. 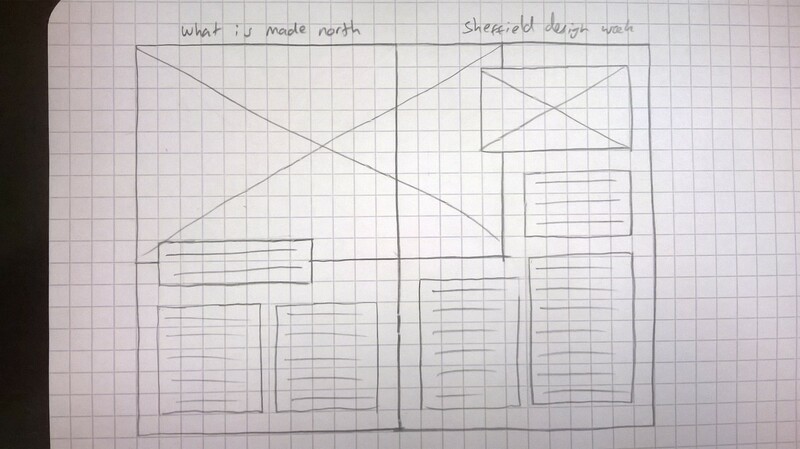 I focused mainly on ideas based around Sheffield. 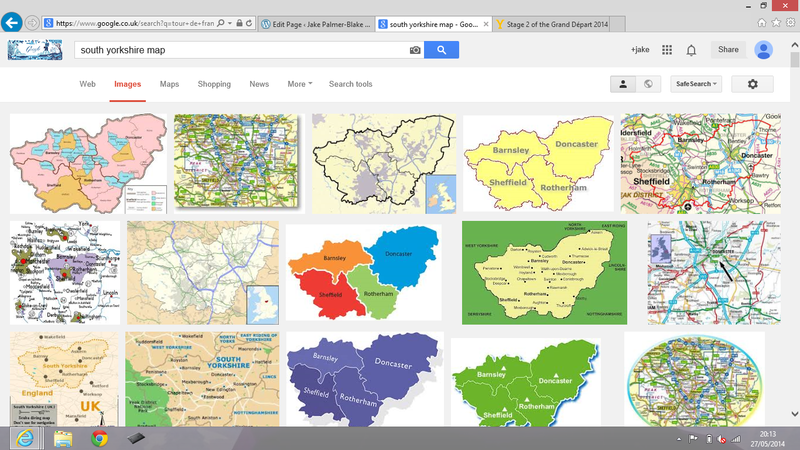 I researched Sheffield to get some ideas. I found out that 61% of Sheffield is green space, steel industry, name taken from the river Sheaf etc. I also looked up Sheffield slang. Words like nah then (now then), oreet (all right/hello), ‘ow do (how do you do), breadcake etc. Square (which came from my research that there is a lot of ‘squares’ in Sheffield, orchard square, paradise square etc. Also positive connotations mean someone who is fair and honest). Edge ( relating to Sheffield’s steel industry. Knife > cut > cutting edge (state of the art, highest level of development, new) > edge). 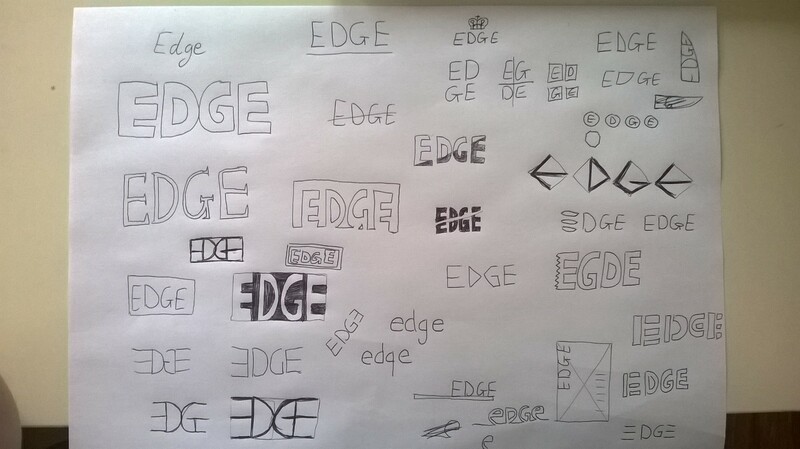 After we went round the group and listened to people’s name ideas, more people preferred Edge to my other ideas, so I am going with EDGE. I started sketching ideas. I didn’t want to edit it too much because it still has to be readable. I liked the idea of having a slash through it 9near the middle of the sketches), it relates to knives and the text is still readable. I got inspiration from the Kerrang masthead, they have done something similar and it works for them. Another idea was having it in a box and have it over to one ‘edge’ which then got me thinking about negative space. I then thought about negative space. I started thinking more about Sheffield famous steel industry and knives in particular and started researching knives and makers marks/hallmarks etc. Having the letters in separate shapes, representing makers marks on cutlery. 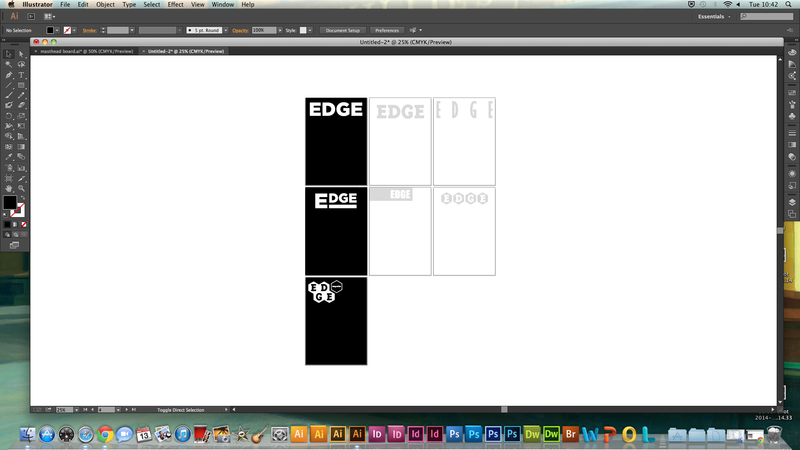 I started a mood board to get more of a visual understanding of how the masthead would look. 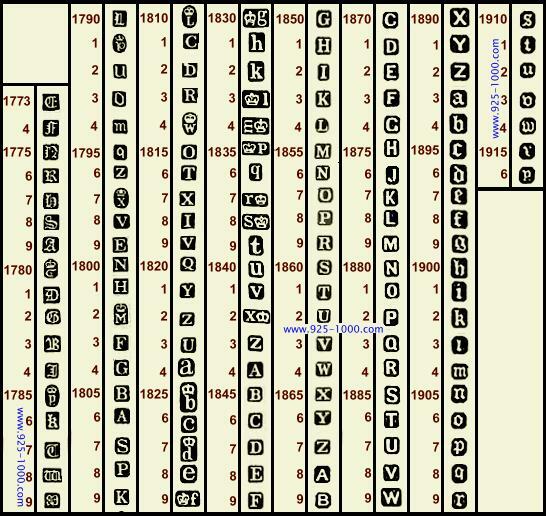 I looked through different typefaces, both default fonts and on the Internet. I wasn’t against just having unedited text for the masthead, but I experimented with different ways of manipulating the text. I knew I wanted to use a bold, sans-serif typeface, so I found some that I liked. My favorite typefaces on it’s own were Impact, Gotham, Triplex Serif Extra Bold and Gill Sans Bold Condensed. I experimented with the slash going through word but it didn’t look as good as as I thought it would. I tried flipping one of the E’s, then both of them to see what that looked like, which looked good. I found a font called American Captain that someone had already downloaded on one of the Macs. That looked the best with the ‘mirrored’ effect than other typefaces. I thought I would give the slash idea some more thought because I thought it had potential. 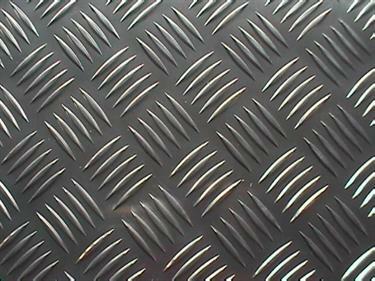 I erased the vertical lines of the Es which looked good, I then thought it resembled the pattern on steel plating (below). I then moved to the hallmarks/makers marks on cutlery by putting individual letters in shapes. I preferred a hexagon to other shapes I used like a circle and square. I then tried going for a more abstract style which I liked. I then reached the point where I had a few designs that I really liked and was struggling to choose between them. To get around this, I put them in soe sort of context by having them on an A4 page so I could see what they would look like. After seeing them sort of as they would be, I narrowed it down to the three left most ideas (below). I liked the one in the middle with the line under the D,G & E, I thought it could be used to put the issue number in, date etc. But in the end, I didn’t think it had more of an impact then the others. I thought I would put a placeholder image so it looked more realistic and believable to further help me with my decision. I liked two of the designs below, one of them is the top right which I think stands out well and is very eye catching. Each issue would be the same style, but in a different colour. It also helps to give the magazine a ‘brand’ and it is different to conventional magazines. My research drew me to this idea as it is unique from the other magazines I looked at, which helps it stand out. 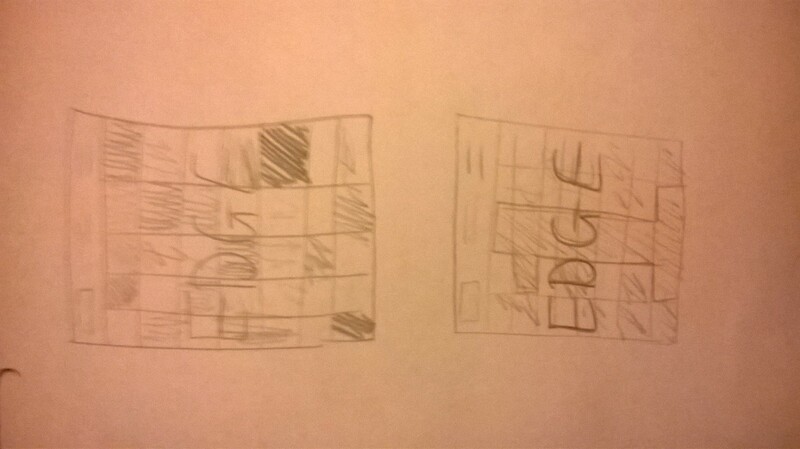 The other is the bottom idea, I tried it with just the masthead, but it didn’t look very effective. I put a border around it and had the masthead on white space which looked good. The image overlapping onto the white space helped it to pop out. 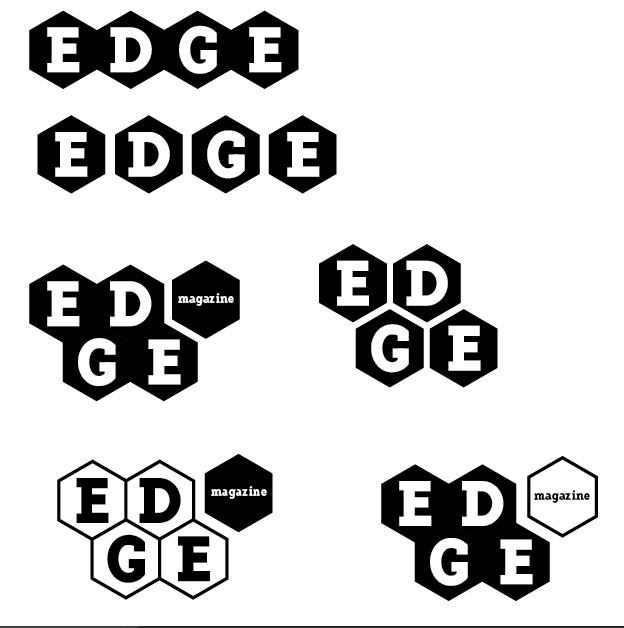 I also thought I could use the hexagon shapes as a motif throughout the magazine. 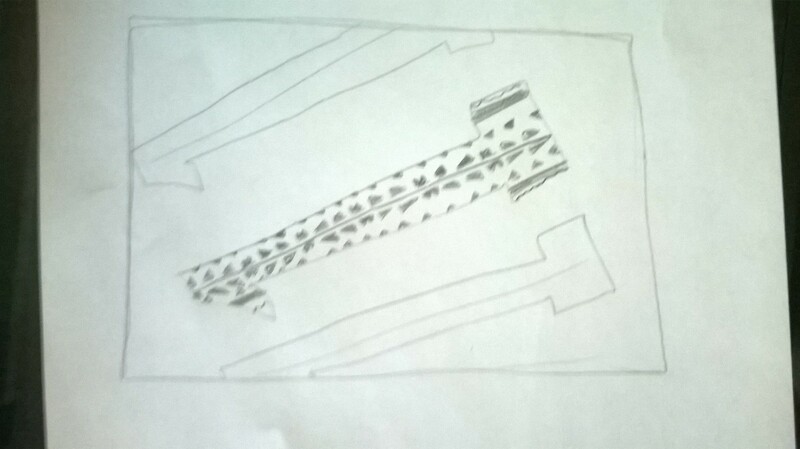 I was back to the situation where I was stuck on two different designs. I then decided that when I had to present these ideas to the rest of the group and tutors, I would use their reactions to both ideas to help me choose which design to go with. They preferred the coloured page with the image coming through it (top left idea) so I am going with that idea. I think my next stage would to be to come up with the content and features, so I can see how the cover lines would work on the cover, but I need the content to come up with the cover lines. 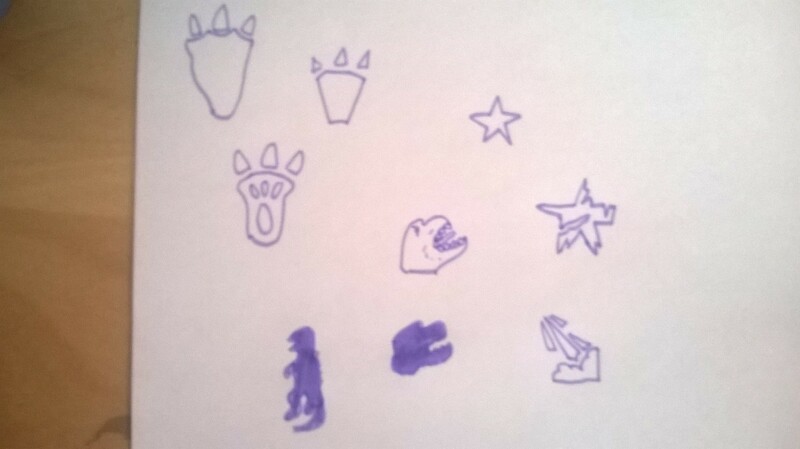 I jotted down some ideas of what I could do the features on. 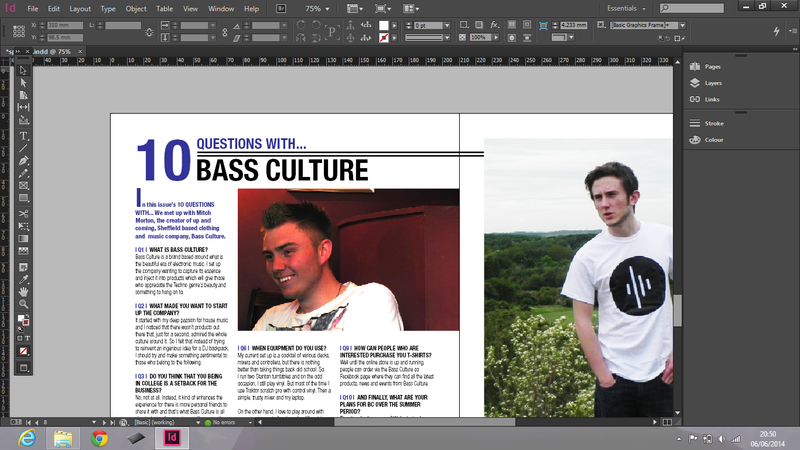 I thought about doing an interview on Bass Culture (who I did corporate identity project for). 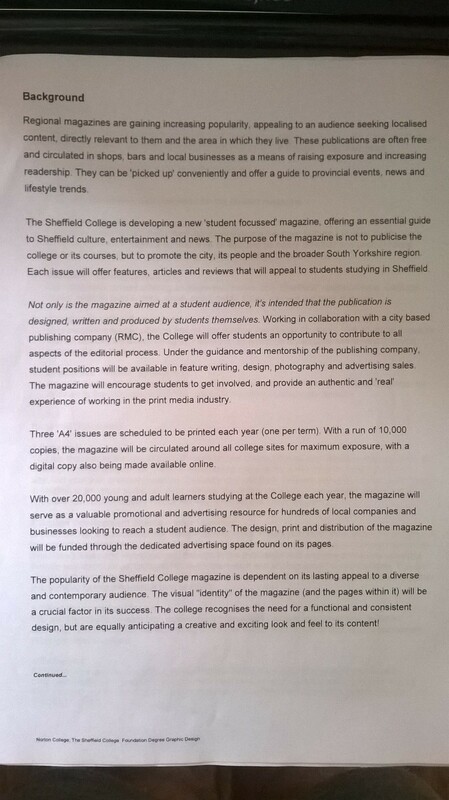 I thought it would be relevant because there target market are students and young adults, it is also based in Sheffield. Another was something for the Tour De France when it comes to Sheffield (including things like the route, date etc) this could also link to the creative practice article as Made North are doing the Art for The Grand Depart. I could also do an article about the New York rip we went on, which could also link to creative practice because we went to Profit. Review of a new film being released, or to relate it more to Sheffield, do it about a film at the Showroom cinema. I saw that they have a film of the month, which could be a regular thing throughout in each issue. 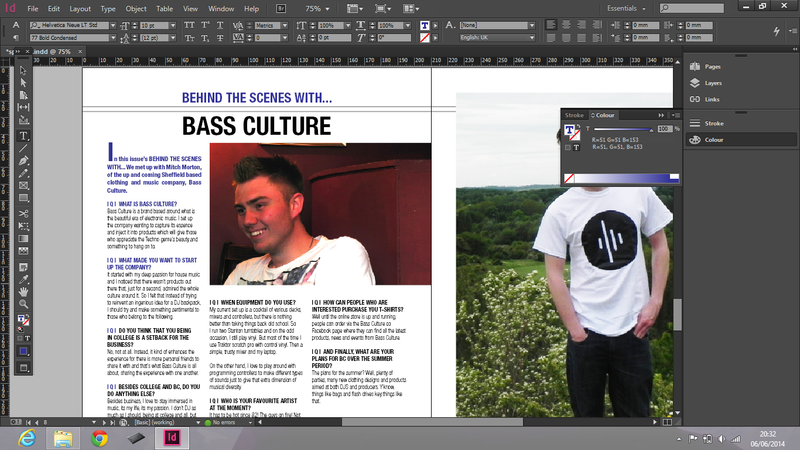 Interview Interview about Bass Culture. Review Film review (Godzilla, Edge of tomorrow, Frank, Pulp fiction 20th anniversary, Docfest at showroom cinema?). 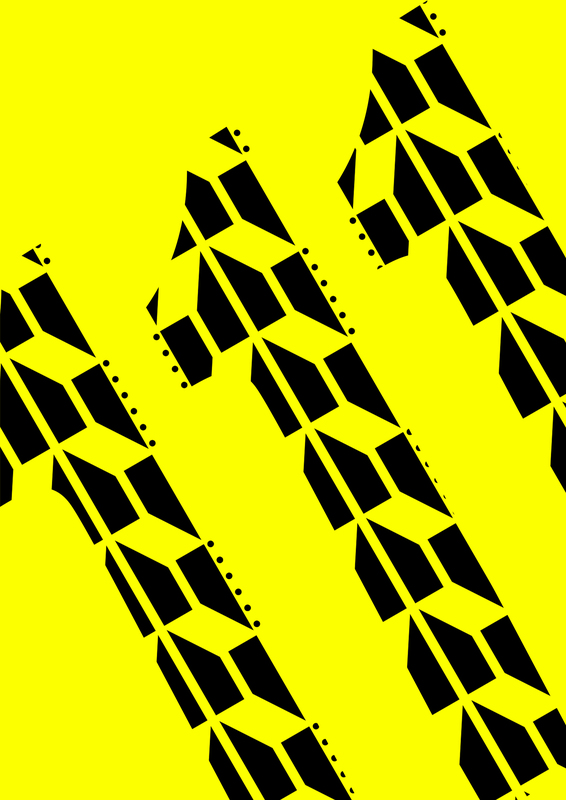 Creative review Made North / Art of the grand depart / Tour De France in Sheffield. Alternative spread Top 10 places to shop for Christmas (to show what could be featured in an issue depending on the time of year). 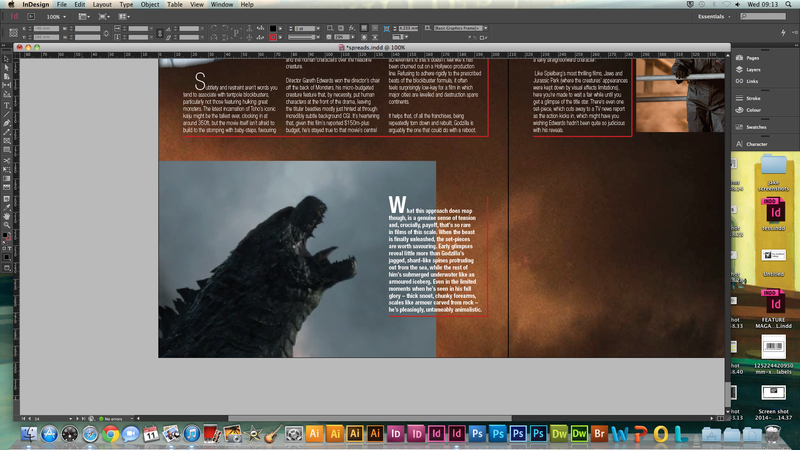 Once I had the articles for the magazine, I started finalizing the cover. 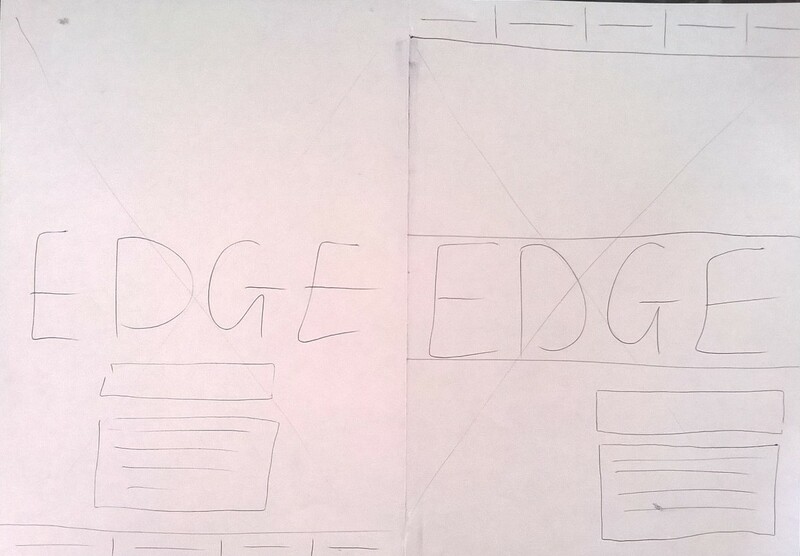 After the crit, someone suggested bringing the masthead right up to the edge. Which does actually relate to the title. I did actually change he font. Originally I chose Gotham, but have changed it to Helvetica Neue because there is more of a selection of weights and styles. It it still bold and looks about the same to Gotham, apart from there is a ‘stalk’ on the G. Anyway, I brought it closer to the edge. I also tried bleeding it off each side, but I didn’t prefer that. I changed the kerning to bring it closer together which I thought looked better, I thought that it would help the legibility when I put on the background image and colour. I tried kerning it so the letters were touching but I liked it better with a small gap between the letters. 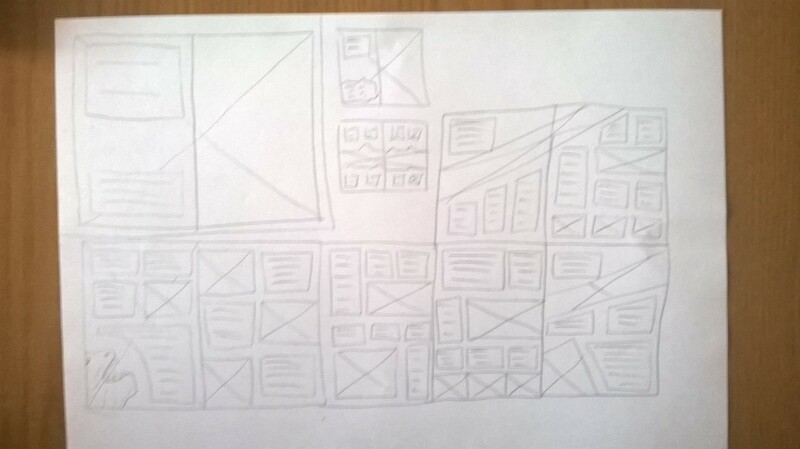 I did some preliminary sketches for the layout of the cover. The original layout I presented to the rest of the group was the right sketch on the first image, with the main cover line in the bottom right. I was told to try it in the centre and along the bottom. I also had the idea of having a white banner going around the page, having it wider at the top to fit in text. Another idea was to have another image (relating to another feature in the magazine) in the bottom right with another cover line relating to that (similarly to the Total Film cover from my research). 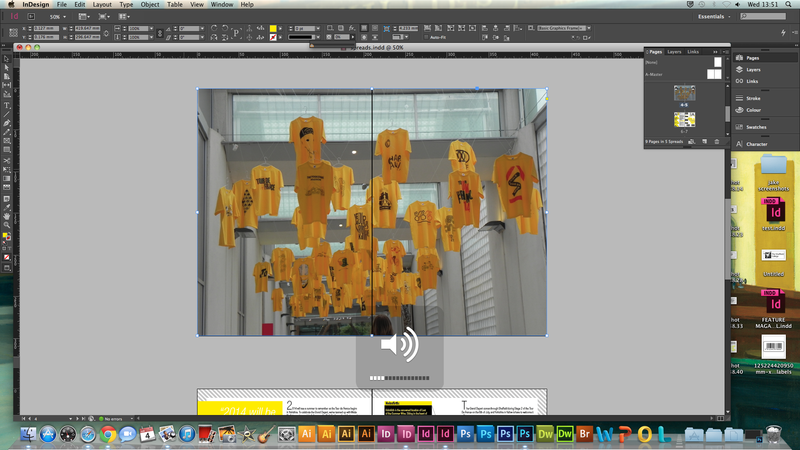 I converted these ideas into digital visuals in InDesign. I experimented with the use of boarders. 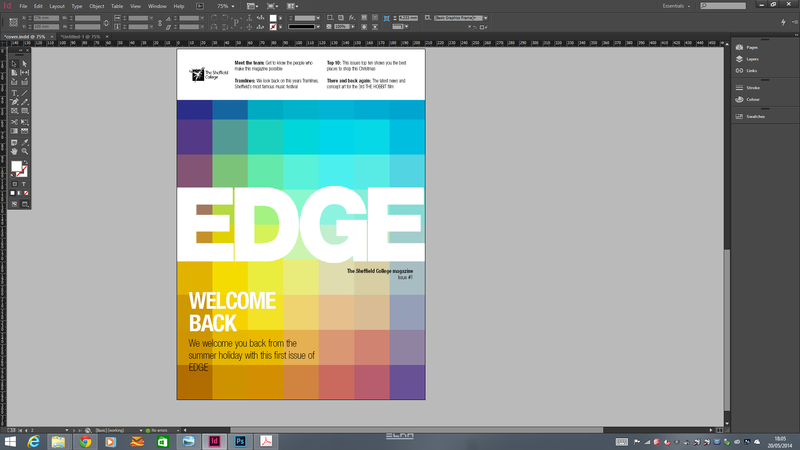 I used a stroke on the masthead as a place holder for now so I could see what space I had to work with. I applied a 5 by 8 modular grid with a 5mm gutter. I chose an image that I can use for the cover image. However, I think I will try generating an image. 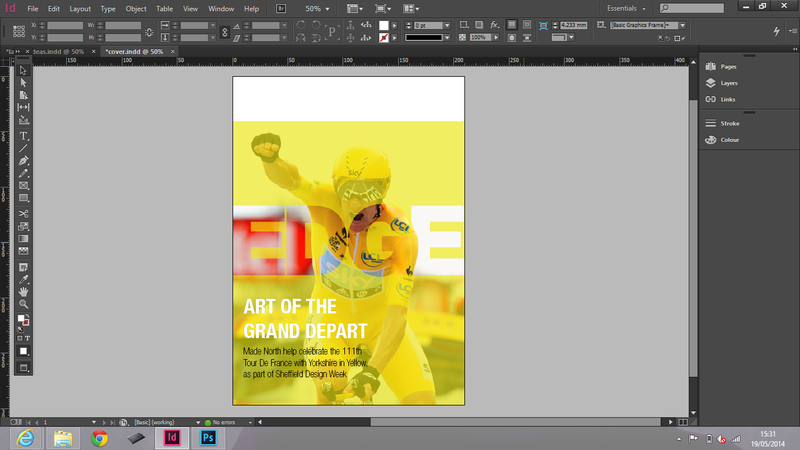 I was thinking a T-shirt design for the Art of the grand depart. I sketched out an idea that I was originally going to send off to Made north, but never got round to it, but thought that I could still use it for this situation. A few others in my group had done some, so I could use one of them if I need to for examples of work in the article. I tried different ways to make the masthead work with the image (above). I couldn’t put a yellow overlay like with the other image because the background was yellow so it didn’t work. I tried it different colours instead, but it worked best with orange. In the end, I think I am just going to use the photograph of the cyclist as it looks better. I can still use this in the spread because I want to show examples of T-shirts. 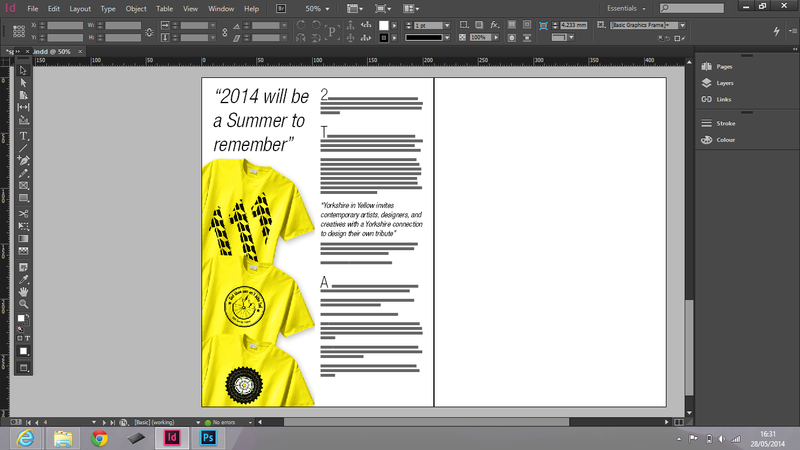 I got some other designs that people in my group had made to impose them onto shirts and put them in the article. For my second cover design, I made one for what would be the first issue. 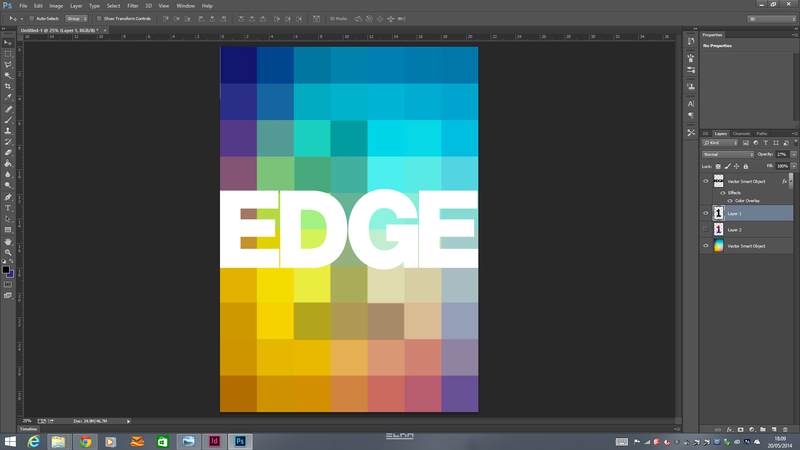 I wanted to have blocks of colour, or a gradient made up of lots of squares. This represents the covers having a different colour overlay each time. I also had an idea of having a number 1 faintly, because it’s the first issue, but I wasn’t sure about that. I started by getting a gradient. 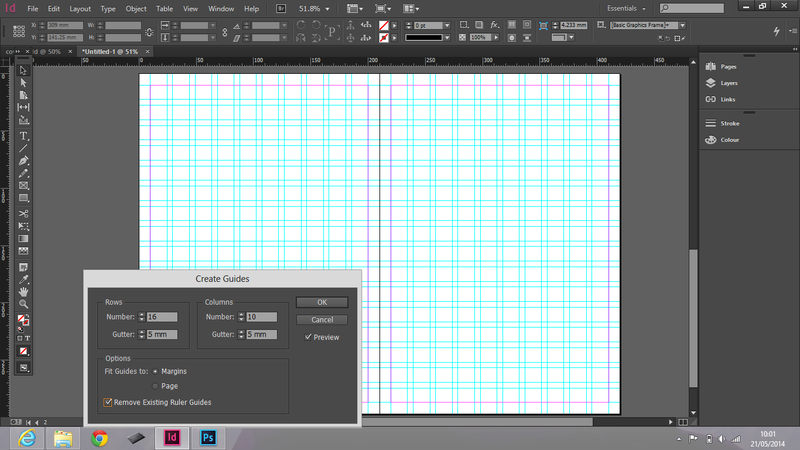 I made a grid in InDesign and put a square in each section. I then selected an individual box and then selected the dropper tool and chose the colour that was in the box space. I repeated this for each box. I really liked this effect and I thought it was a good idea to say I came up with it out of nowhere in the middle of the night. I tried the number 1 idea that I mentioned before. First just by lowering the opacity on a black shape and then by inverting the colours of the blocks in the selection. However, I preferred it without the one, so I placed it into a new cover page. I did have to flip it so the blues were at the top and orange/red at the bottom because it worked better with the cover lines. 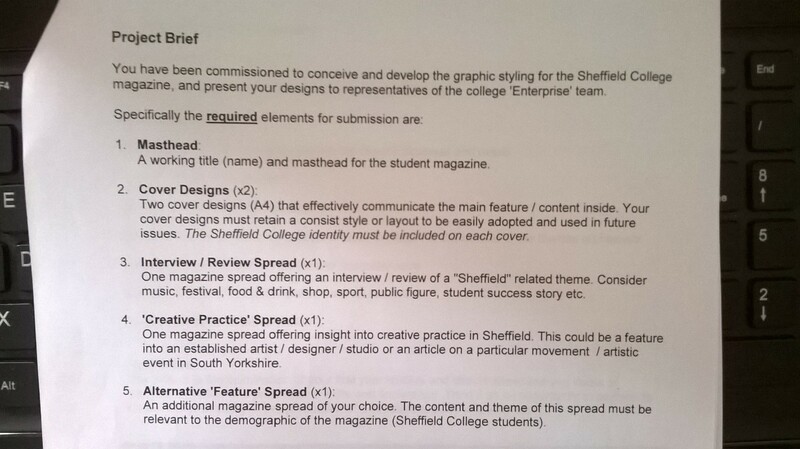 I placed the Sheffield College logo, issue number and secondary cover lines and tried different placements. I settled on the layout below. Once I had finished my cover, I started work on my spreads. 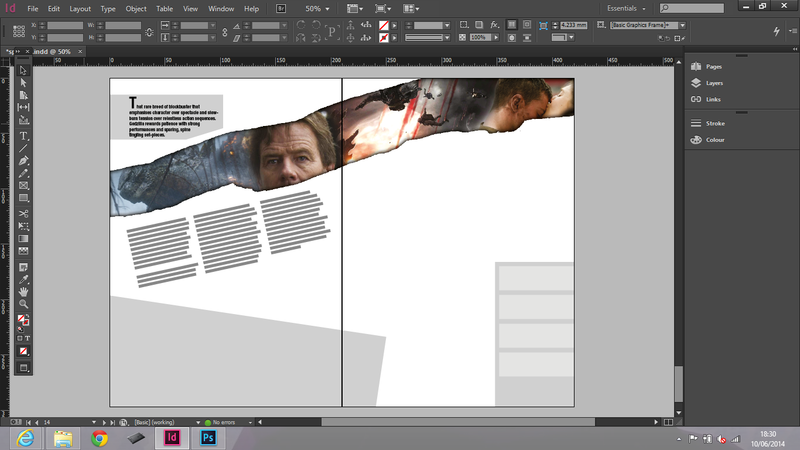 I opened up a new InDesign document with the same margins and grid as the cover. I thought that the 5 x 8 grid worked well on the cover because there was less aspects to it, but because there is more to work with in the spreads, I thought I would double the amount of sections in the grid. I will try and keep to the 5 x 8 but I added more in case some of the aspects didn’t fit properly. This will give me ore flexibility. I changed my mind again. This time, I made the margin 15mm and did a 6 x 9 modular grid. I put a guide at the bottom of the page to indicate where the text should not go past. This leaves space for the footer. 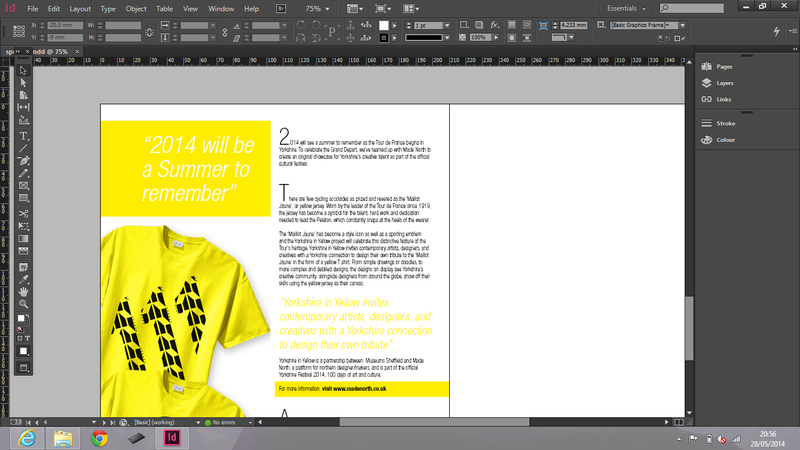 I started on the creative spread, which is for Made North and Sheffield design week/Yorkshire in yellow. 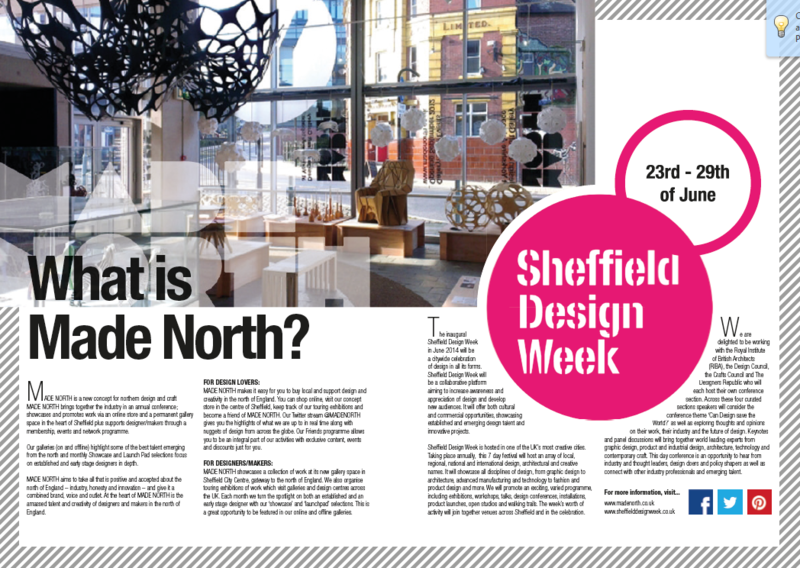 I wanted to start with an introduction spread to what Made North and Sheffield design week actually is, then Yorkshire in yellow/Tour De France will follow from that. I worked it out and figured that this article with be either be 3 or 4 spreads depending if I have a leader page or not. 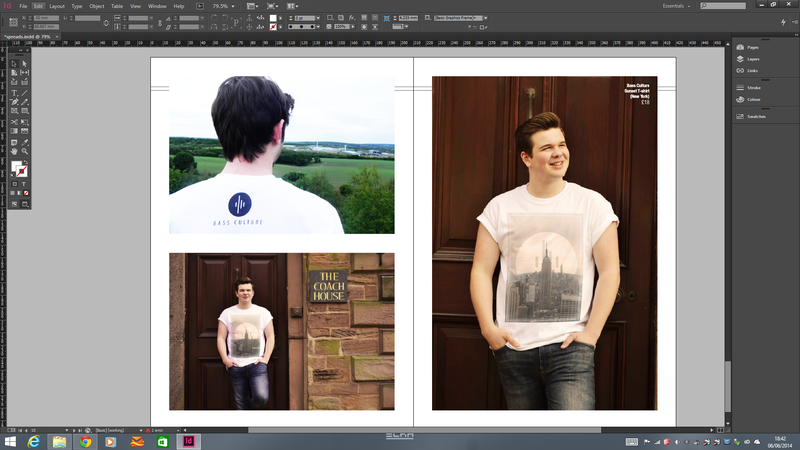 I came up with a few different layouts for the intro pages, but the one below was my favourite. As it is a intro page, I didn’t want too much text and smaller images, I think this layout is a good mix between both picture and text for a simple intro to the following pages. 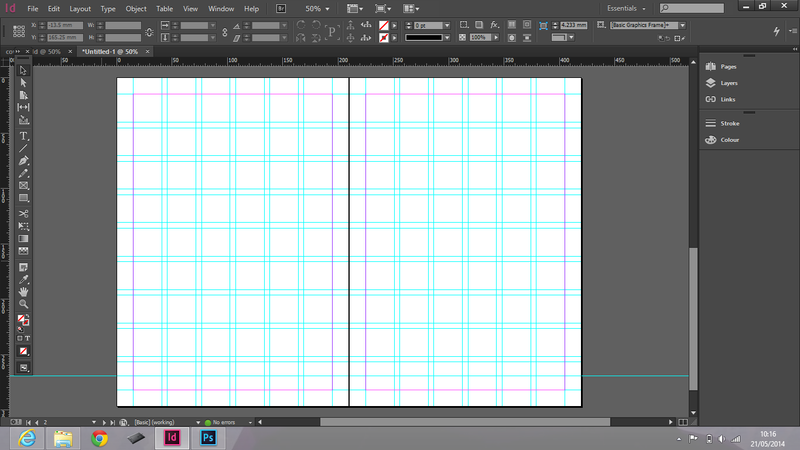 I converted my sketch to the InDesign document. Using grey boxes to represent images and frame tool boxes for text. I had the image going across both pages to link them together. The content on the separate pages could be seen as different subjects, but the image shows they both belong to the same subject. I used an image of the Made North gallery because it was relevant. I wanted the title to overlap the image because I had seen it in other magazine spreads and thought it looked good. I think it helps ties in the image and also separates the title more from the main body of text. Above are different ways of making the text stand out more, because when I placed the image in, the ‘what is’ blended a bit with the image. I liked the white box idea but I had another idea of having the Made North logo in white with lowered transparency. This helps show the company’s identity and helps the title to be more legible. Below is the final spread. I made and included a dashed boarder. I did this because when I was on the made north website, I noticed they used this pattern a few times, so it links it more to the brand and also, like the image going over both pages, it helps bring both the pages together. I wandered a bit from the original layout sketch. 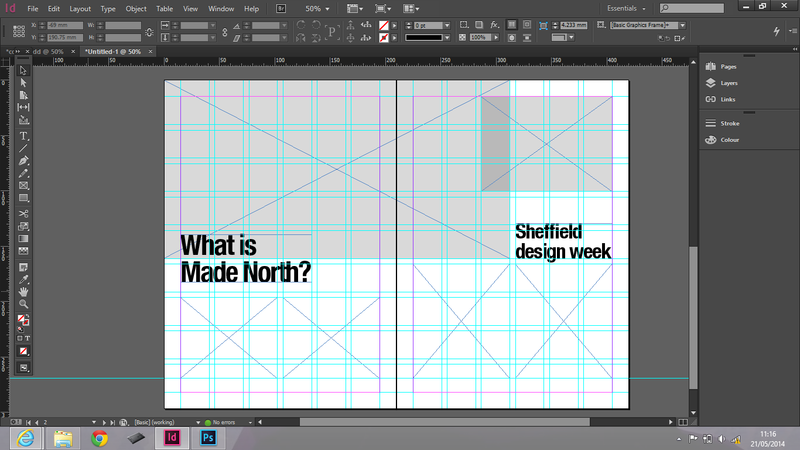 Instead of having another picture and a title, I decided to use the Sheffield design week logo. I made another circle to include the date. I used a white boarder round the circle to separate it from the main image and I made the text wrap around it to add design to the text and make the aspects of the page work together. I included the websites and social network sites that they are on at the bottom of the page. 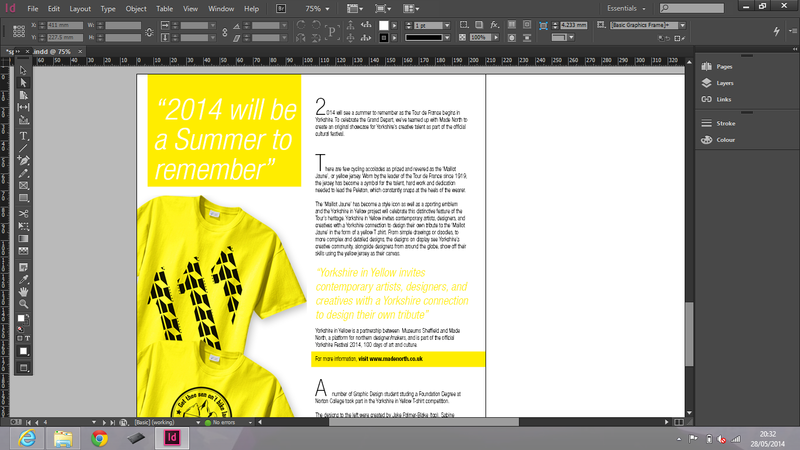 I did some more layout sketches for the Yorkshire in Yellow article (below). I liked the idea of having a map of the Tour De France route. I thought about doing it just for the Sheffield route, and also for the full route. Having Sheffield on one page, then the rest of the route on a double page spread. I also wanted to include some T-shirt designs from students. I asked around the group to see who did some designs for Made North, I used my own design and 2 others and super imposed them onto a T-shirt. I wanted to have a map to show the route of the Tour De France. I know I wanted to show the route in Sheffield/South Yorkshire, but I wasn’t sure about the rest of the grand depart (in London and the North of England). But I did know I wasn’t going to show France, which seem weird because it’s Tour De FRANCE, but it’s for a SHEFFIELD student magazine, and the article is about the Grand Depart. I looked at the Grand Depart website and maps of South Yorkshire to get an idea of how it would work in the magazine and thought about styles I could do it in. 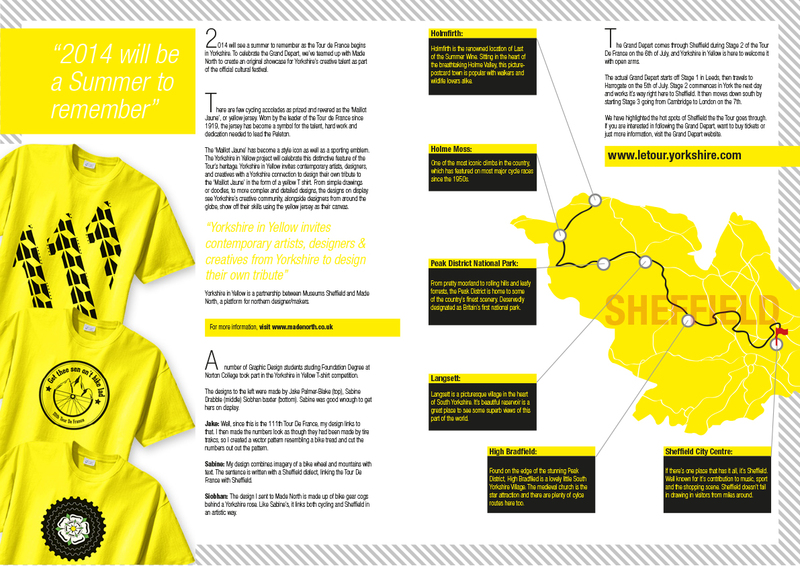 I looked at the styles that are used for Grand depart and Yorkshire in Yellow. I liked the vector images of the bike rider and gave me some inspiration. 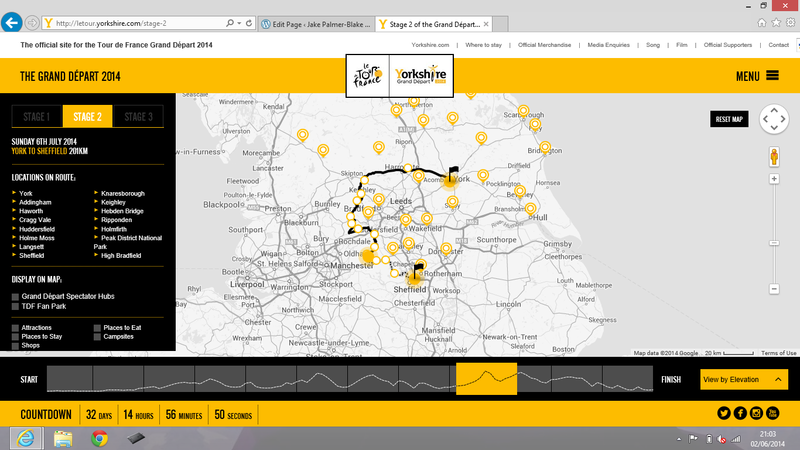 I thought I could use it as a cyclist riding around the map following the route of the grand depart. Well it would just be a dotted line or something but I would like to include the cyclist somewhere. I’m not sure whether or not to have a leader page, but I will have more ideas once I finished the spread. 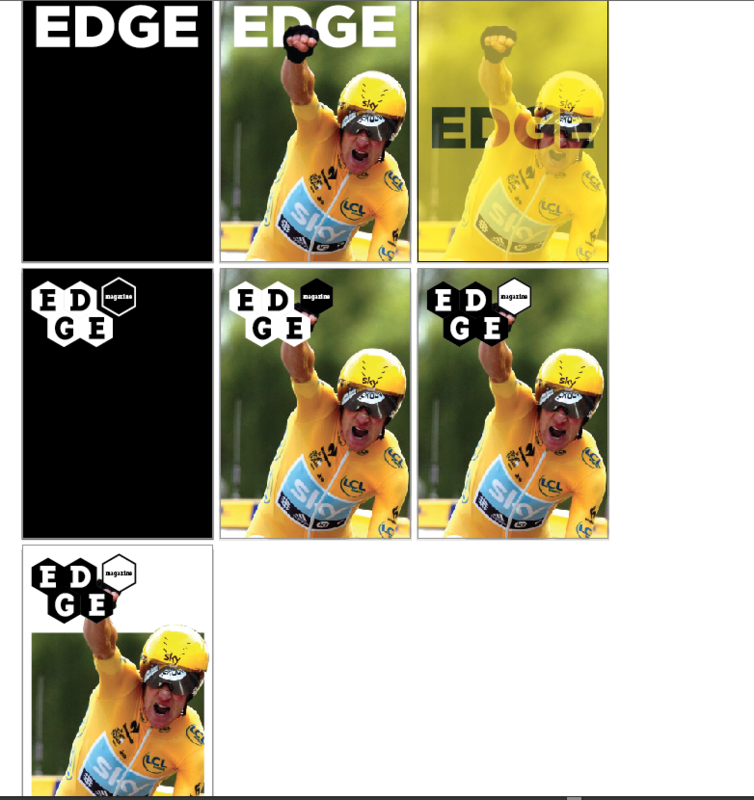 I would say though that the second image on the cyclist on a full yellow page would look good as a leader page. I will try different methods of doing the imagery, just so I’m not just using that actual image. 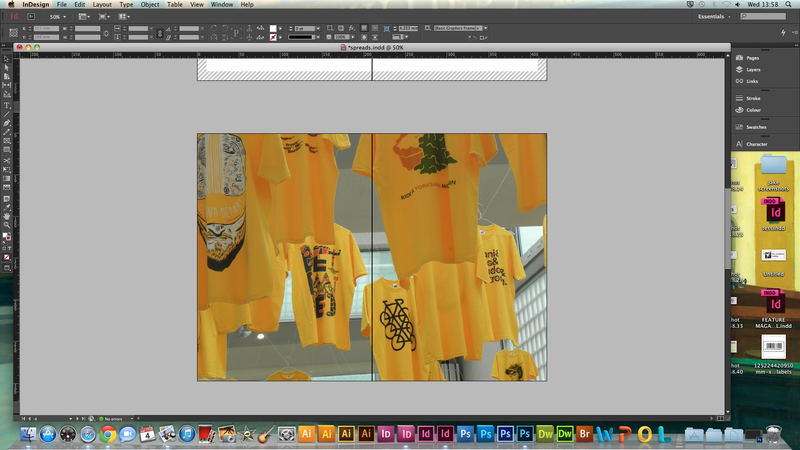 I tried different ways of laying out the images of the T-shirts. I settled on the shirts leaning in from the left. I got the relevant text of the Made North website and Museums Sheffield website. 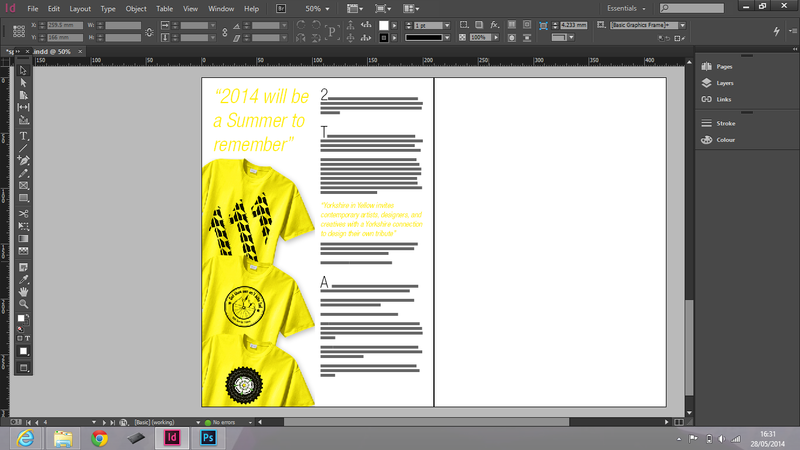 I also added my own text about the T-shirt designs. 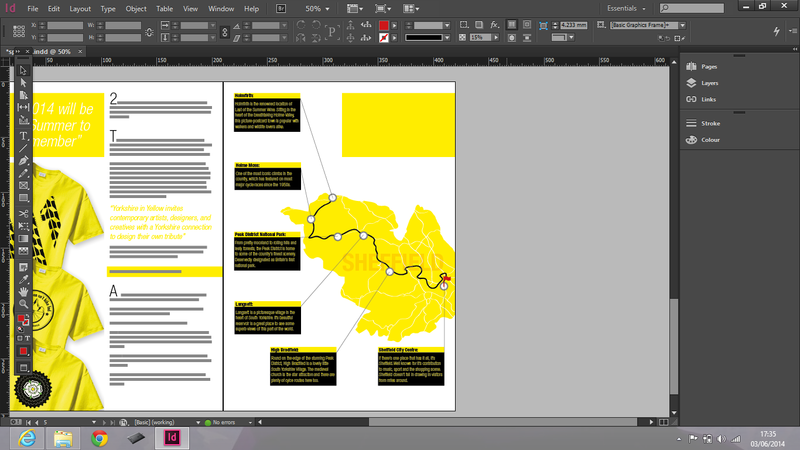 I started on the next page by making the map for the Grand Depart route through Sheffield. This page will include info on hotspots during the route. 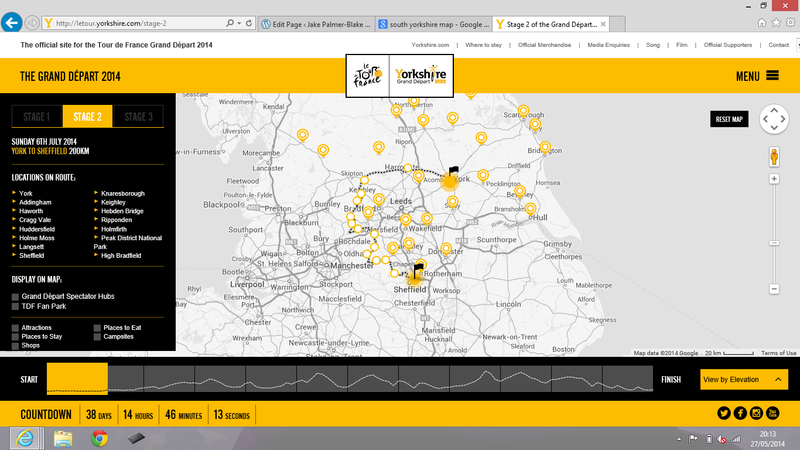 I looked on the grand depart website http://letour.yorkshire.com/stage-2 to find the route. I found a map of the boundaries of Sheffield (after a long time of searching). I then cut out the shape of it in Photoshop and put a screenshot of the Grand depart map behind it, so I could pretty much line it up so it fit correctly. 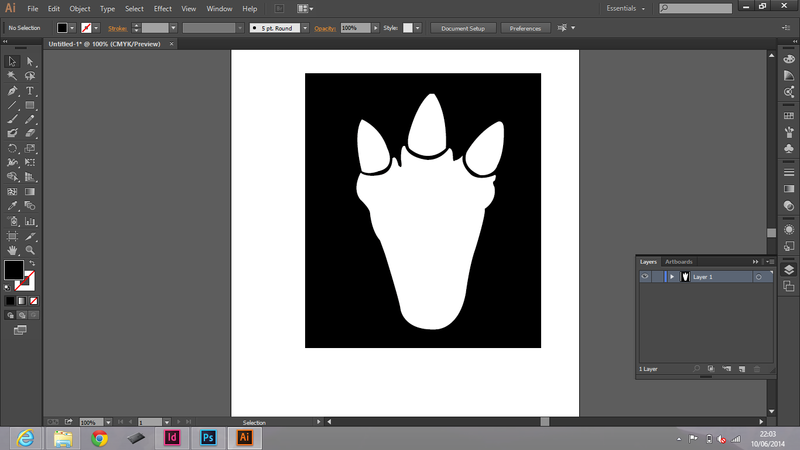 I then copied that into Illustrator and used my graphics tablet and the pen tool to make a vector shape of Sheffield. I then switched to brush tool and followed the path of the tour, then added in the roads and the same ‘hot spot’s that was mentioned on the map. Once I had finished the map, I copied the text describing the hot spots. I added the finishing touches to the map (a flag to indicate the finish and ‘SHEFFIELD’ faintly on the map). I tried different ways of displaying the text with the image. I experimented with the textboxes and bleeding off the page (this was to keep it consistent with the previous page), but I preferred it without the bleed. I changed the colour of the boxes to black. This kept it consistent with the style of the website which I thought was a better than grey. I copied the yellow rectangle from the other page onto this one to place some text into it (this will keep it consistent). However, I thought there was now too much boxes on it, and also, not having the text in the box helped to differ it from the boxes of text. I did separate the text from the web address which I liked. 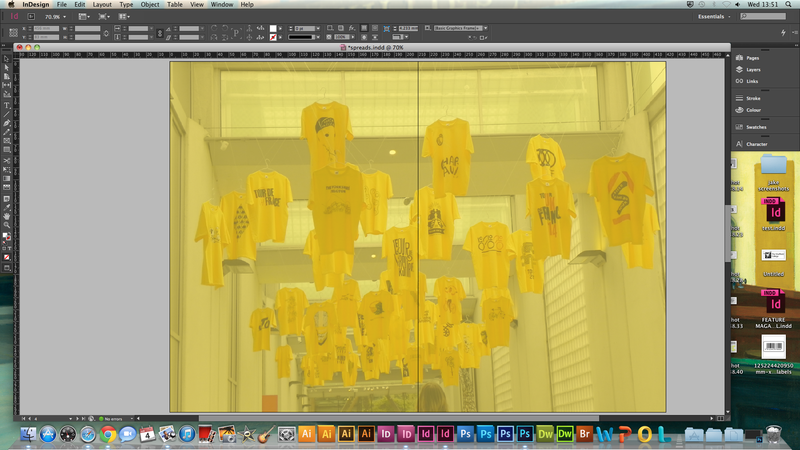 For the cover image, I went and took some photographs of the T-shirts on display at the Millennium Galleries. The ones below were my favourite to use. I slightly touched it up in terms of contrast and colour. I thought about editing the image to make it stand out more. I tried making the background greyscale and the shirts colour and other effects, but in the end settled on a yellow hue. I tried a few variations of doing it and in the end, used photo filter effect, which kept the shading and luminosity. I think this works well, and suits the topic of the article (Yorkshire in YELLOW). I wanted to have the dashed lines like I used for the border in the other spreads, this will keep it consistent so you know it’s all part of the same thing. 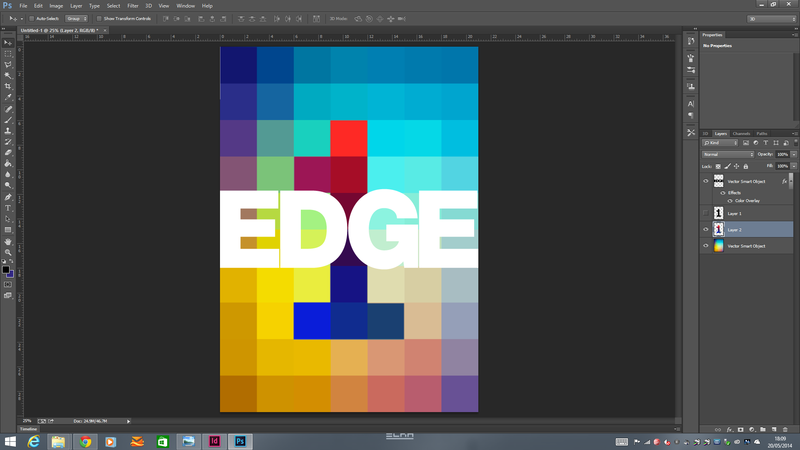 I experimented with having it as a border like before, but I didn’t think it looked really effective. I came up with this box design with the title inside it. I tried different stacking and alignments of the text (left, centre, right). In the end, I settled on YORKSHIRE on top and IN YELLOW on the bottom. I thought this worked better on the page. I did a few key line sketches for the interview spread. 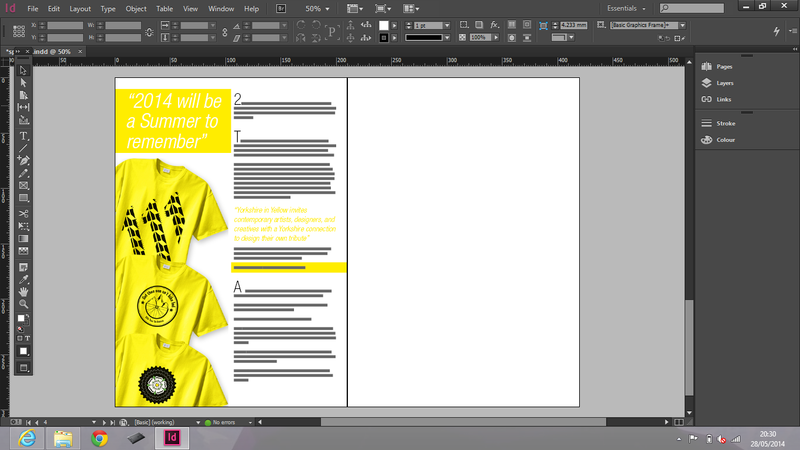 I thought about having one page of an example of a T-shirt and the other containing the interview. 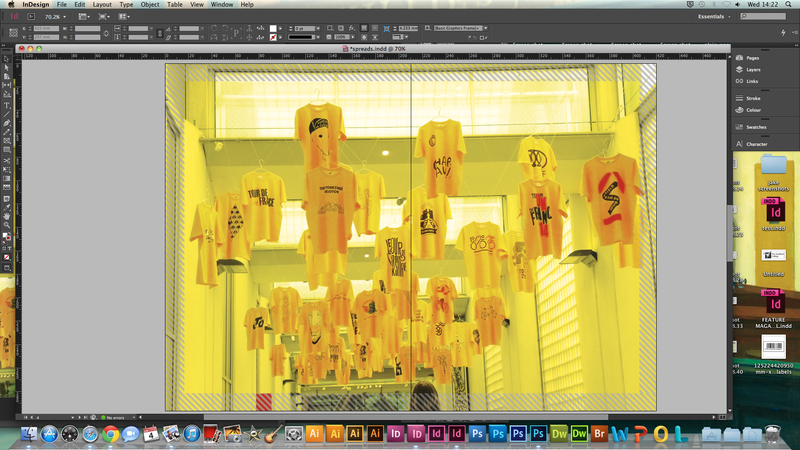 Another idea was to have all these intersecting shapes that included photos of the shirts, models, dj etc. And another idea was to have an image in the centre with the questions and answers around it. 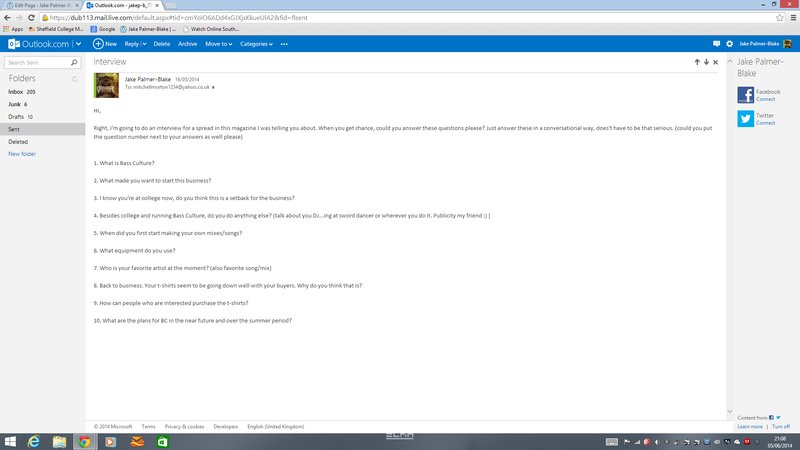 The first thing I had to do was do the interview, so I came up with some questions to ask him and emailed them, to which he responded with the answers. I now had the text content for the spread, now I just needed photos. Because the business is just starting up, he is focusing more about the clothing aspect than the others, so I got a friend to model just the basic logo T-Shirt. 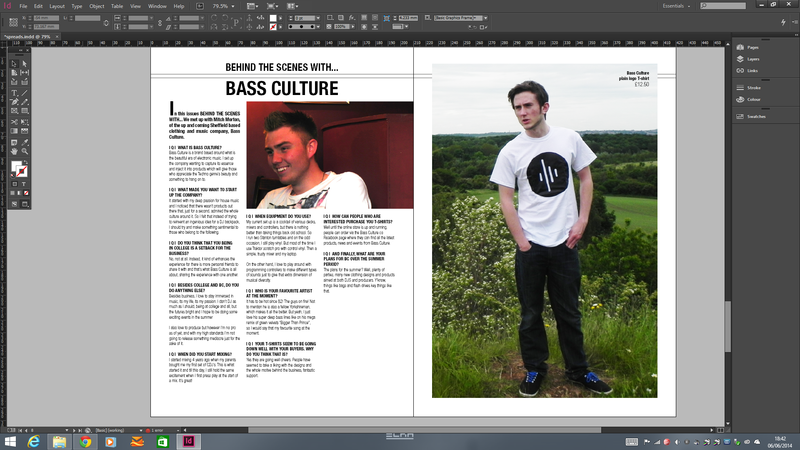 I also took some photos in a local pub of Mitch (the person behind Bass Culture) as if we were in the interview. Below are the images that I thought were best to use (The lighting and things were a bit off on some of them, but nothing I can’t handle of Photoshop). I edited the images to put them into the spread. I changed the brightness, contrast etc. I thought of changing the design on the T-shirt because I had made another design previously, which hasn’t been printed on clothing yet. 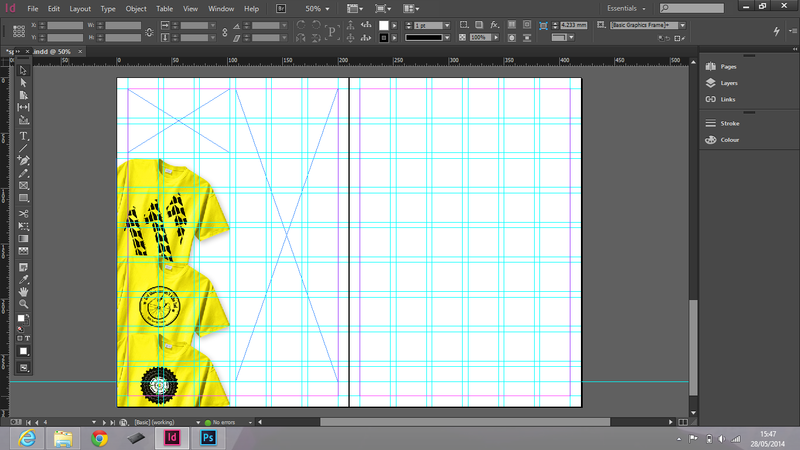 To do this, I used the clone stamp and patch tool to cover up the logo on the shirt. I then placed the new design in and resized, distorted and warped it so it looked sort of realistic, but I didn’t think it worked on this image in particular. I tried another photo, but I preferred the original own I used. I then started to piece together the spread. I didn’t want a leader page for this, spread. Just to vary the designs of the spreads. I copied the interview text into the spread and added hierarchy to the questions to differentiate them from the answers. I tried different ways of composing the title. Originally, it was just supposed to be an interview spread, but when I was designing it and coming up with the name, I decided that this should be a regular item in each issue, so I came up with a name for it that would work in each issue. “10 QUESTIONS WITH…”, then whoever the interview was with, would come after it. I wanted a colour to use, instead of it being all black and white. I thought about which colour to use, and thought it would be good to have a colour relating to something. 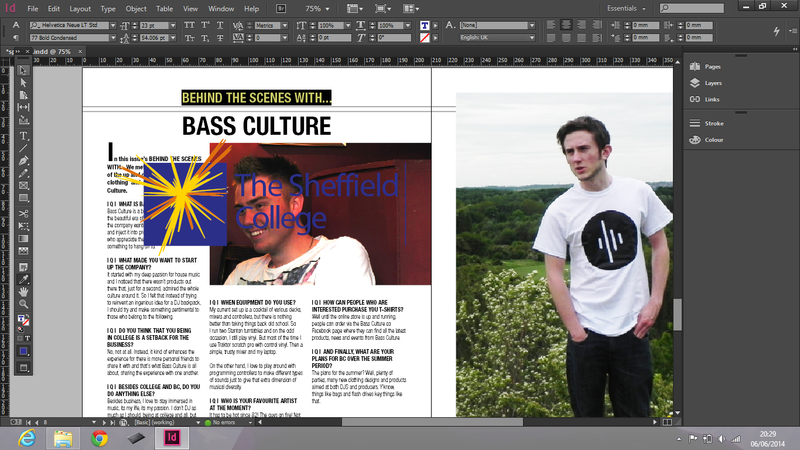 So I settled on the blue in the Sheffield College logo. I tried the other colours, but the blue worked the best. After trying different variations, I came up with the design on the bottom image. I liked the idea of the lines at the top, and carried it through, which gives it a motif so you know the page is part of “10 questions with…”. I added another spread to show how the motif works. I continued with the interview page because I had a blank space at the bottom right and wanted to see what it looked like with something in the space. I didn’t want dwell on this part, because I thought it looked okay with space there. I remembered the images I did for the Corporate Identity project. I placed the image of headphones I super-imposed the logo on to (which I thought was a relevant image because there was something relating to it in the interview). 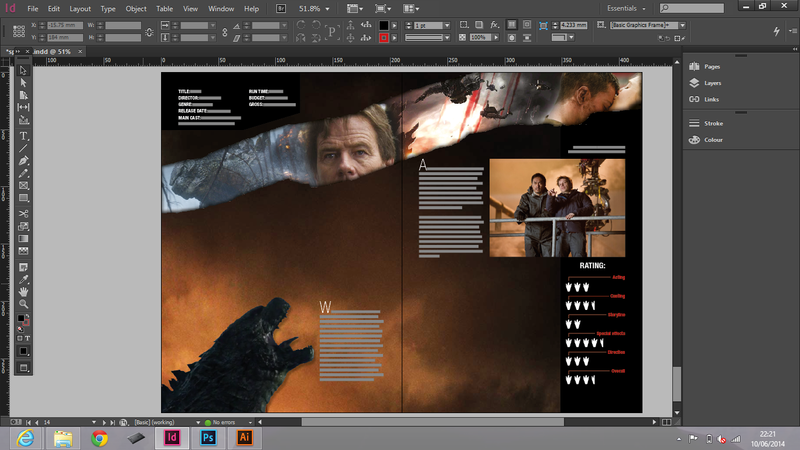 For my final spread, I chose to do Godzilla because it was a film that has recently been released, it had a few reviews on the internet, and thought it would allow me to do something different in terms of design and layout to what I have already done. I came up with a few different ideas for spreads while drawing key line sketches. One of my favourite ideas was to have a tear running through both pages. 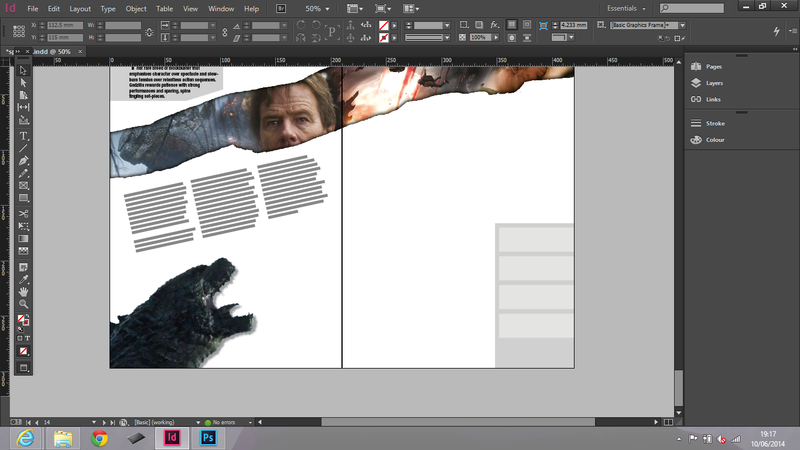 Inspiration for that came from a previous spread for The Walking Dead, which I did last year in BTEC. I found a number of different images that could be used for the leader page. I settled on the same image that is used on the main poster, I think because I really like it and also it is recognizable. For the title, I used “THE KING OF MONSTERS IS BACK” which is what Godzilla is known as in Japanese. I tried to find the font that had been used on the poster and in the end, used Impact. Although not the actual one, it is very similar, apart from the roundness of the corners in the O and D.
I didn’t edit the text at first, but I thought it needed it to make it more visually appealing and relevant. To edit it, and make it look destructive, I started by using the polygon lasso tool to take chunks and cracks out of the text. I then shifted and tilted some sections to make it look more un even and destroyed. I thought another nice touch would be to have pieces crumbling off. So again, I used the lasso tool to select and move pieces. Once I had got it the way I liked it, I inserted it into the spread and adjusted the size and position. I then ended up tilting it a little to the left which looked way better than having it perfectly vertical. I looked back at my key line sketches for the spread and converted them onto the InDesign document. I liked the idea of having an image strip or tear/rip going across the page to carry on the destruction aesthetic that I did on the title in the leader page. As I was laying out image boxes and text, I thought about making a box for some info graphics or a rating chart (like star ratings). 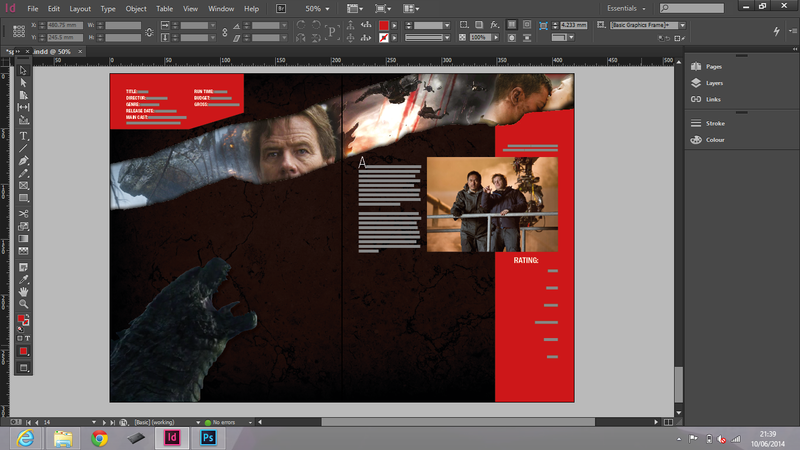 I started to change the placeholder text to the text of a Total Film review I found. I gathered relevant imagery to use in the spread. I started with the tear across the page. 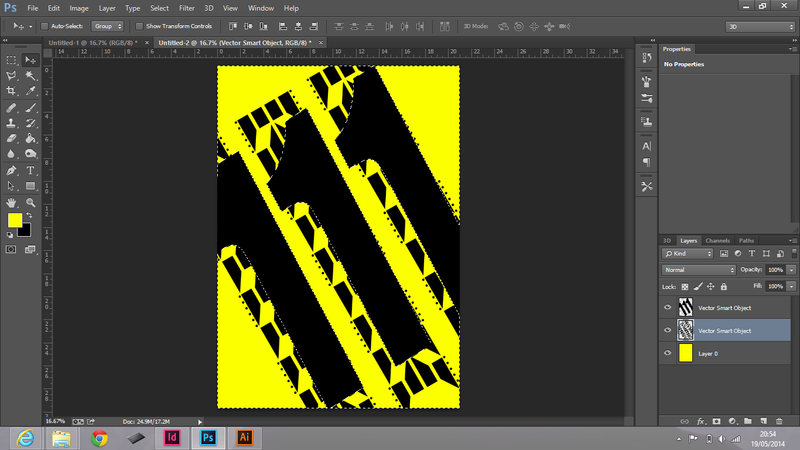 I copied the shapes into Photoshop to edit the image and so It would be the same size so I can copy it straight into the spread. I originally thought about using one image, but as I was changing the picture to find one that worked well, I thought about a ‘montage of images, blended together. Once I found the right images and put them together, I ripped a piece of paper, photographed it and edited it into the image to get the torn effect, then adding a drop shadow to add depth to it. (the outcome of that is below). Once I placed it into the page, I didn’t really like the background I made. So I got rid of that for the moment, and started adding other imagery. I remembered one of the images that was originally going to be the leader page image. I thought that it could work on the spread, so I originally used the pen tool to erase the background and just used the head of Godzilla. I thought then I could include a photo of the making of Godzilla or filming of it, because there was a paragraph about that sort of thing in the review, so I looked through the internet for a good image. I then thought about the star ratings. 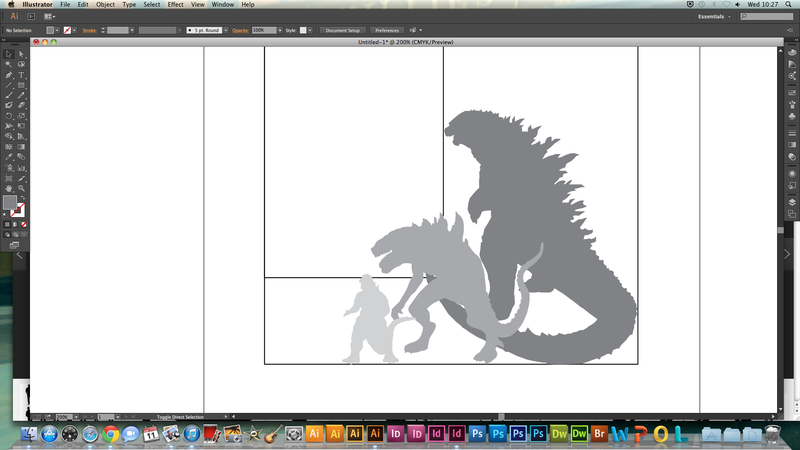 However, I didn’t just want stars, but a vector relating to Godzilla in some way. I did some sketches of some ideas. 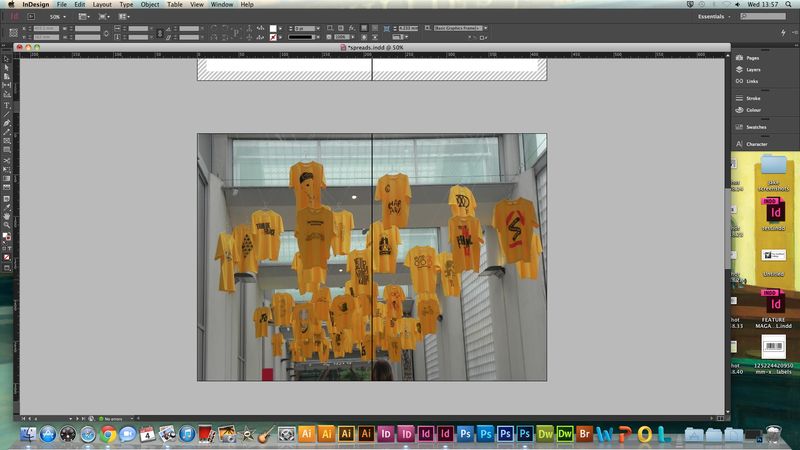 I then made vectors of the one I liked the best in Illustrator. 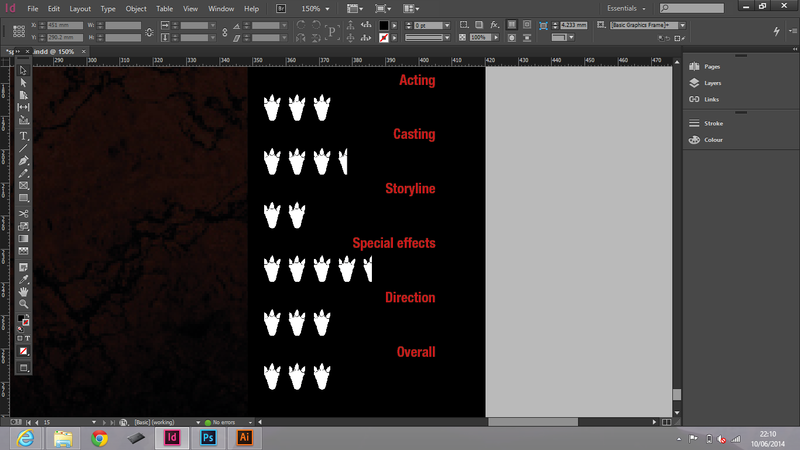 Then placed it into the spread numerous times, representing stars to show ratings for different areas of the film, then the overall rating. I tried the boxes in differenet colours but ended up settling on black. I added more text and a background. I kept it consistent with the leader page by using the same image, but just the sky, so it added texture to the page which I thought looked better than a block of colour or white. I thought this differed it from the other spreads that I made. I decided to change the Godzilla head image to the original, with the background. I thought this helped break up the page and separated the section of text from the rest. I tried different ways of laying out the type with the image, but ended up just having it in bold black type. I was having trouble with what to put in a gap on a page. I could put some more review, but it looked to text heavy and felt like it need to be broken up a bit. I remembered about a Godzilla size chart that I saw whilst looking for images to use and decided to make my own. T make it, I found good images of different types of Godzilla and went round them with the pen tool in Illustrator to make a vector of it. I didn’t have enough room for every Godzilla to date, so I just used which ones I thought were the most recognizable. I ended up choosing the current one, the 1998 and then the original 1954 one. I then had to find out how tall they were and re size them to work with each other. I then decided to make a vector for a human to get a feeling of scale. I saved it and then placed it into the spread. 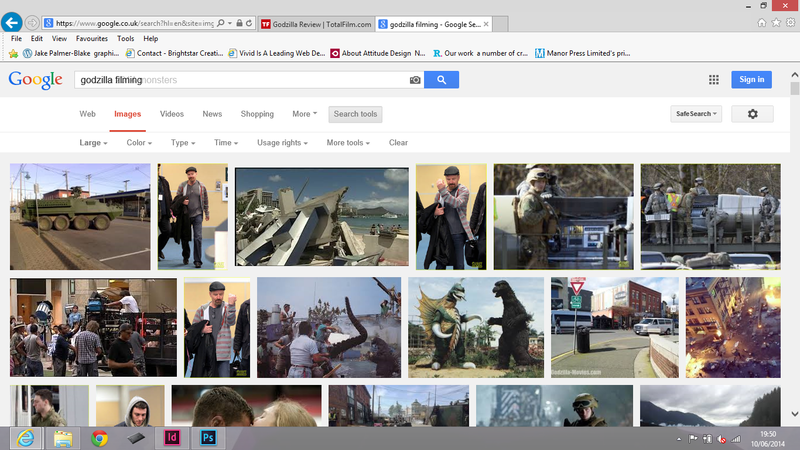 I then added the text about the current Godzilla being the biggest so far. 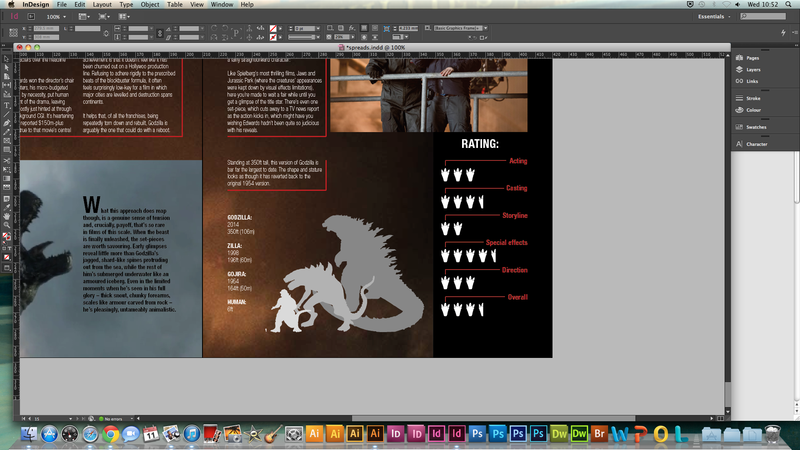 I then added information about each Godzilla. Not much, but just the name, size and date of them. I was adding the final touches and finalizing the spread and decided not to have the text on the left hand page tilted, because I had come up with these lines sort of outlining the text (just to give the text a bit more detail. I tried other things like a box behind it and then having the box off lined with the text which look okay but I preferred the red line. Also it spread the red of the ‘rating’ text across the spread. The final thing I had to do was add the footers (which I had almost forgot to do). I looked through different magazines such as Creative review, exposed etc. And ended up with the page number in a box, then the magazine name and date outside the box.